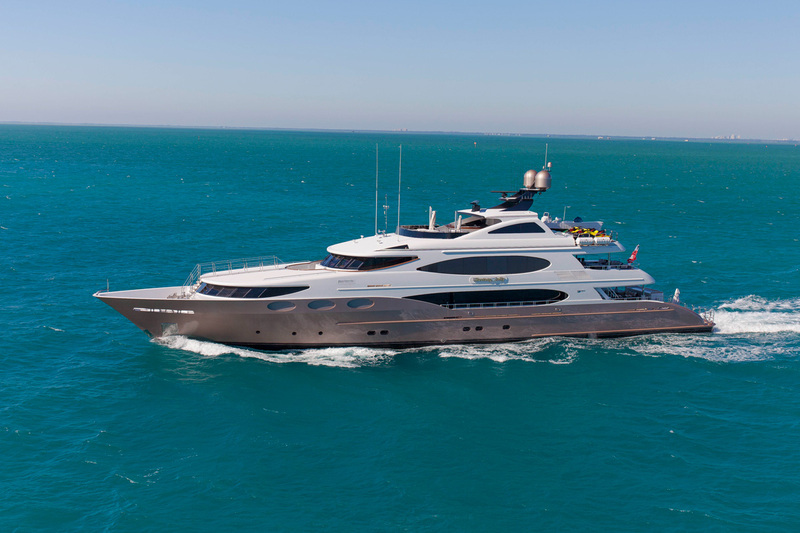 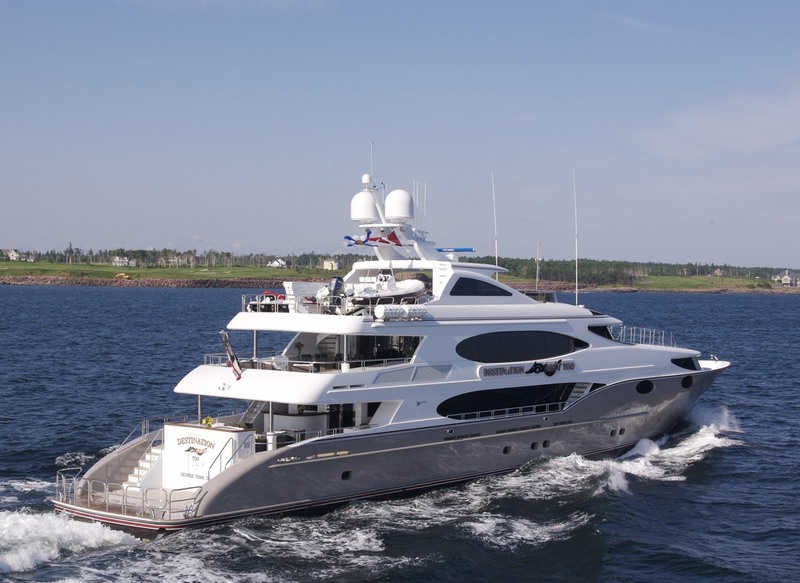 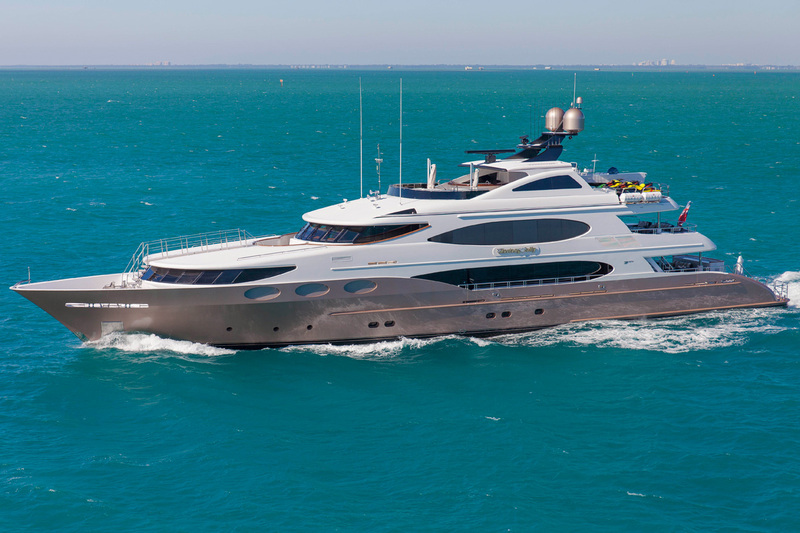 Motor yacht MUSTANG SALLY (ex Destination Fox Harbr Too) is a 2008 49m (161') Trinity Aluminium Semi displacement luxury yacht with interior design by Patrick Knowles. 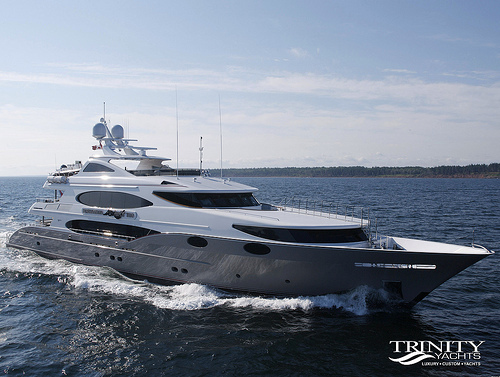 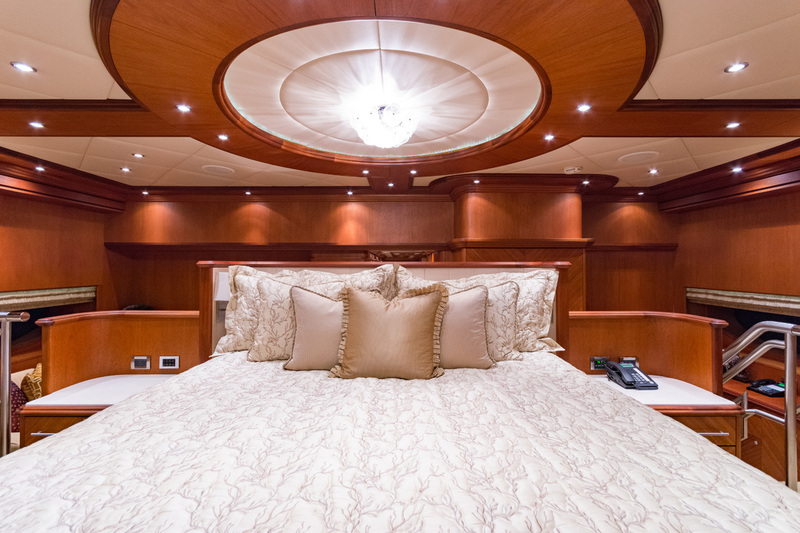 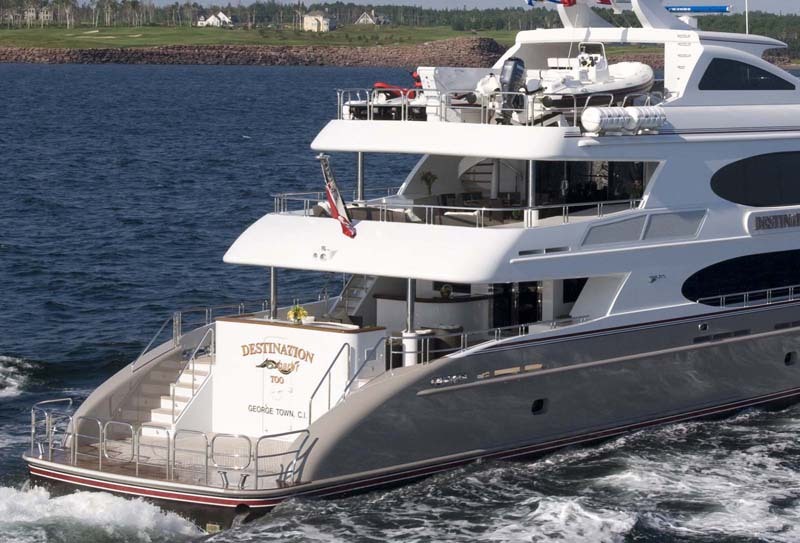 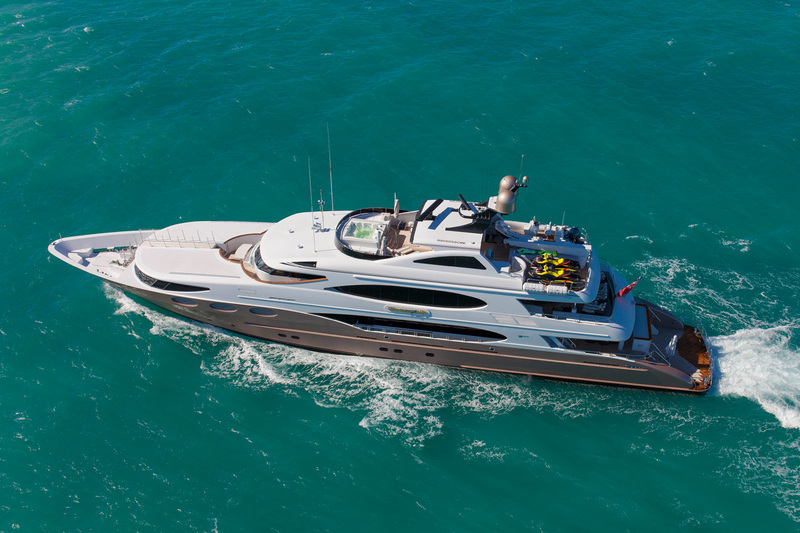 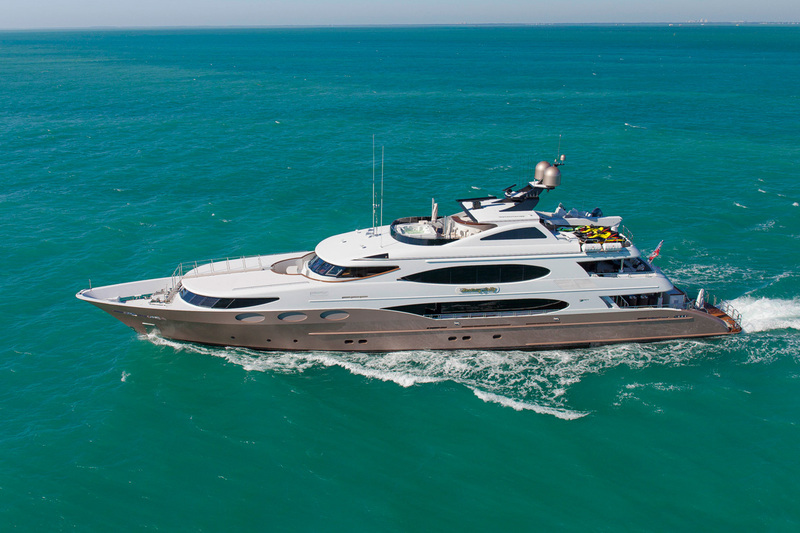 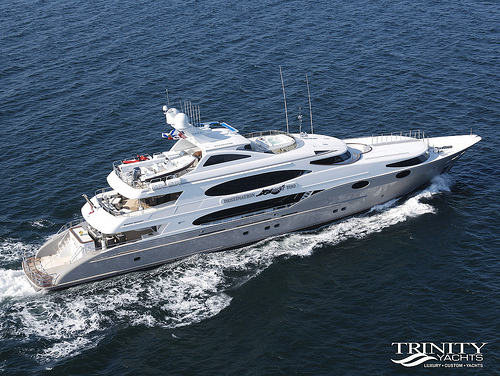 With superior naval architecture and construction by Trinity yachts, MUSTANG SALLY offers unsurpassed luxury when accommodating up to 11 charter guests overnight and 12 cruising. 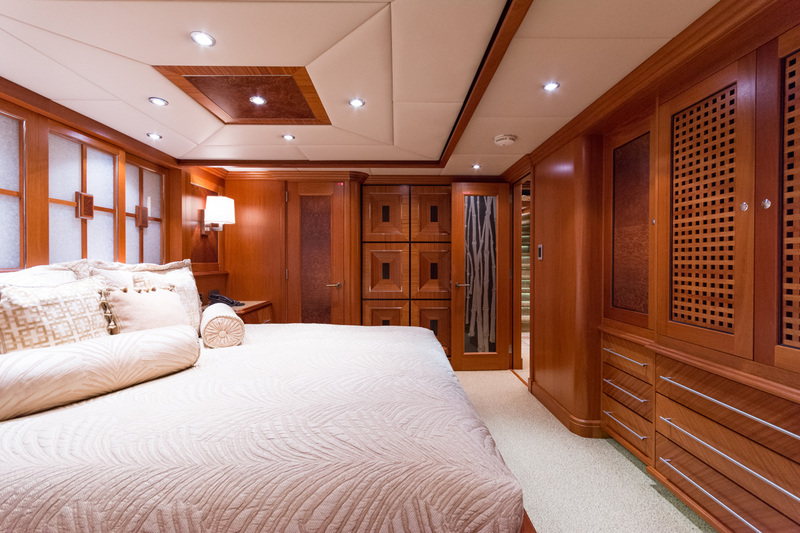 Her interior can be described as modern, relaxed and simple and includes soothing natural woodwork and beautiful furnishings. 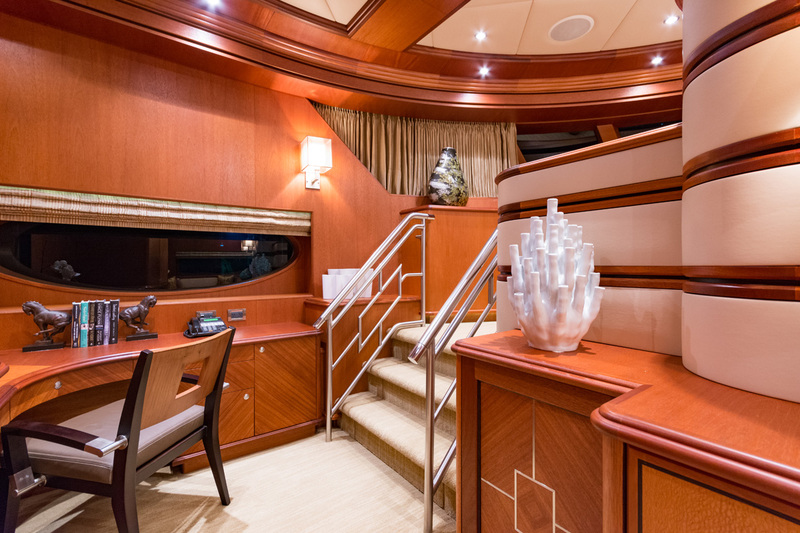 Intelligent contemporary interior and exterior design layout provide maximum space and functionality, both inside and out, for your vacation. 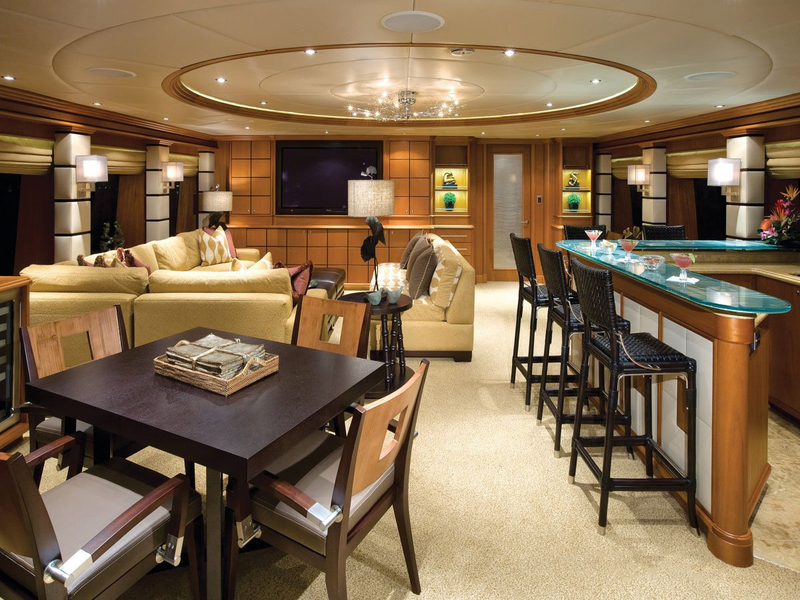 The main salon has a full wet bar, lounge area and 42” flat screen TV with DVD, individual satellite receiver, and surround sound. 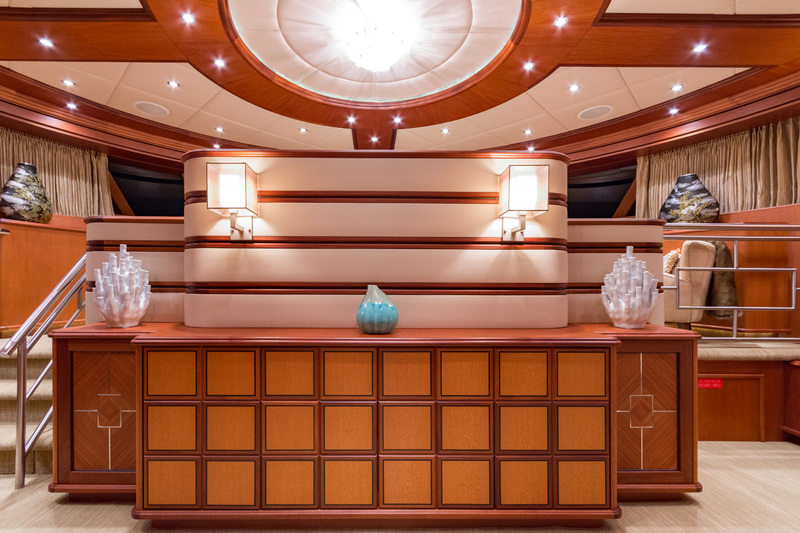 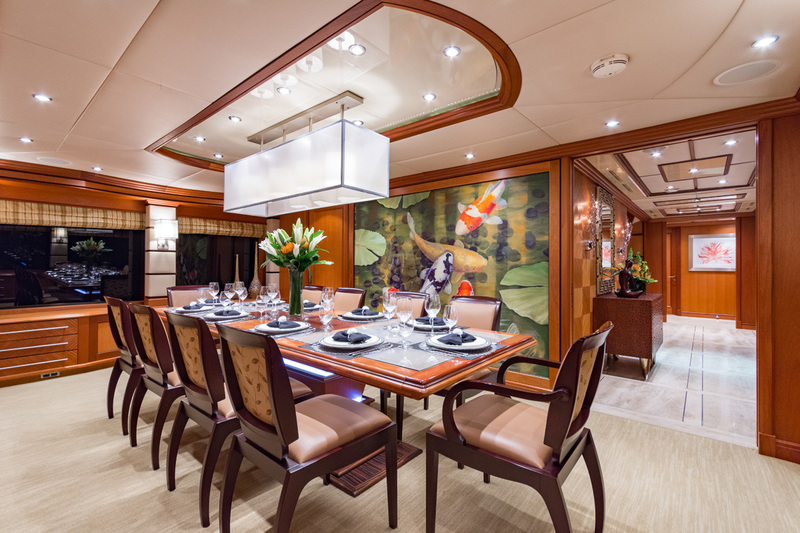 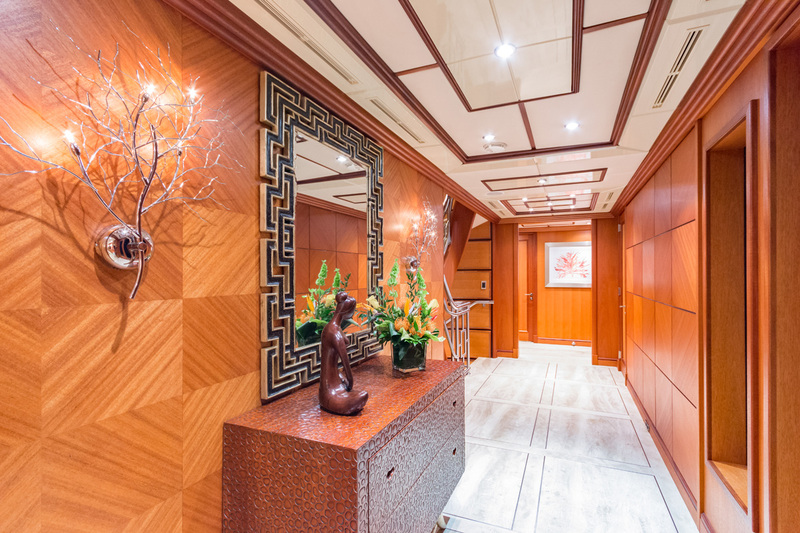 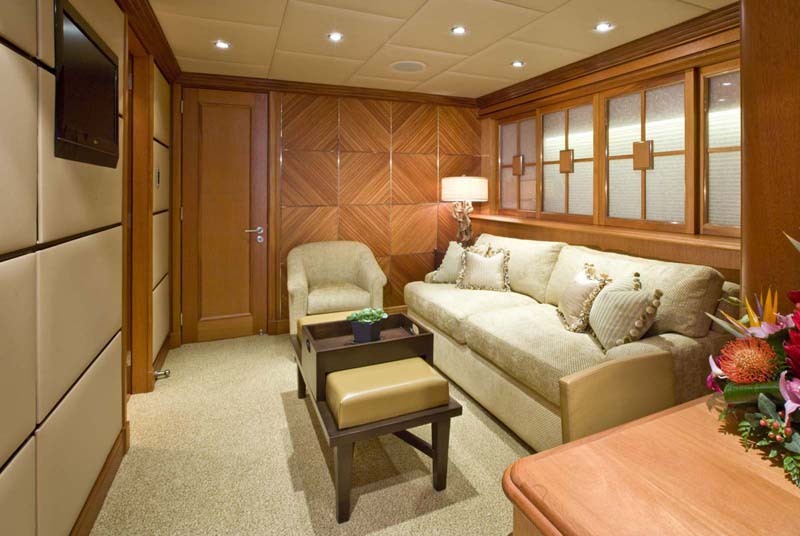 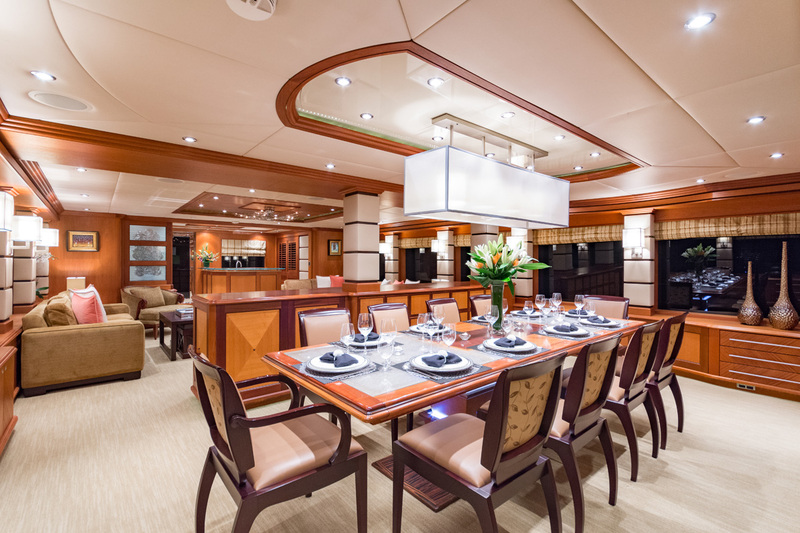 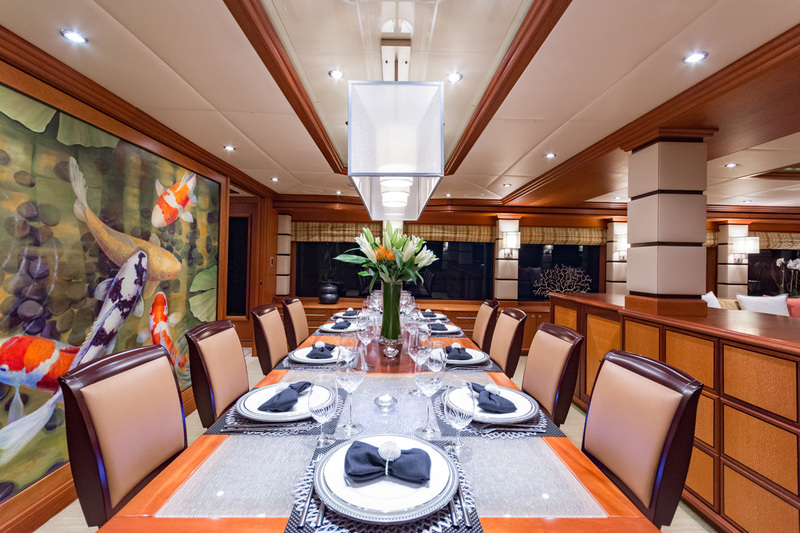 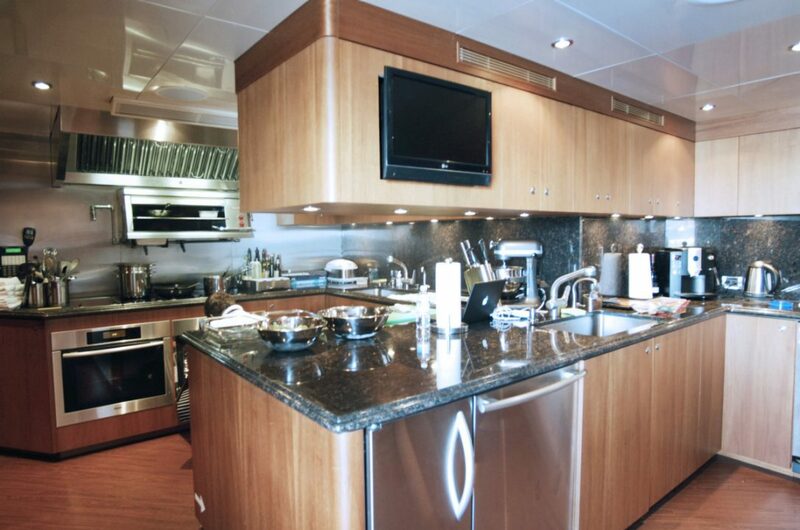 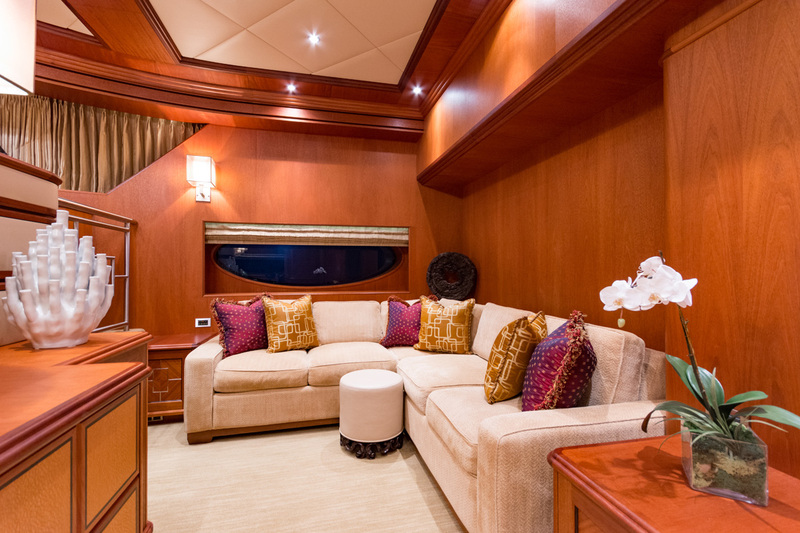 There is a formal dining area for up to 12 guests and day head to starboard. 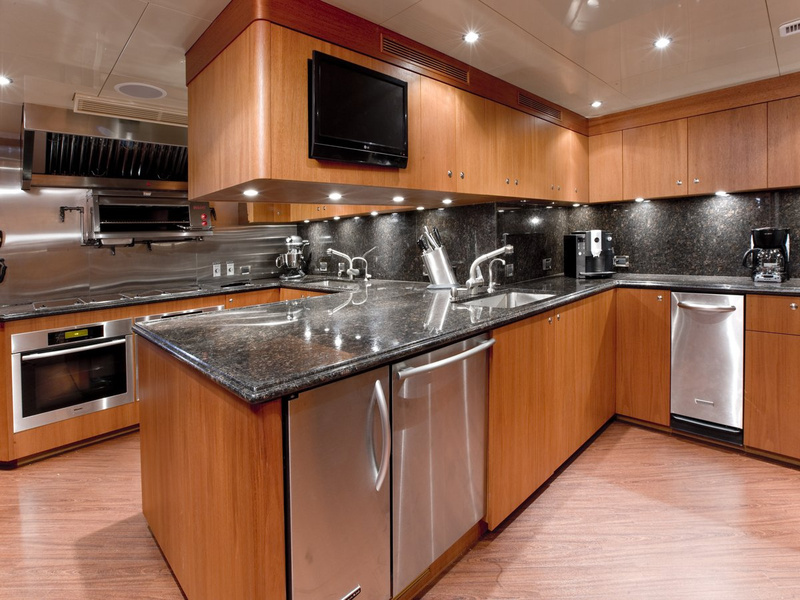 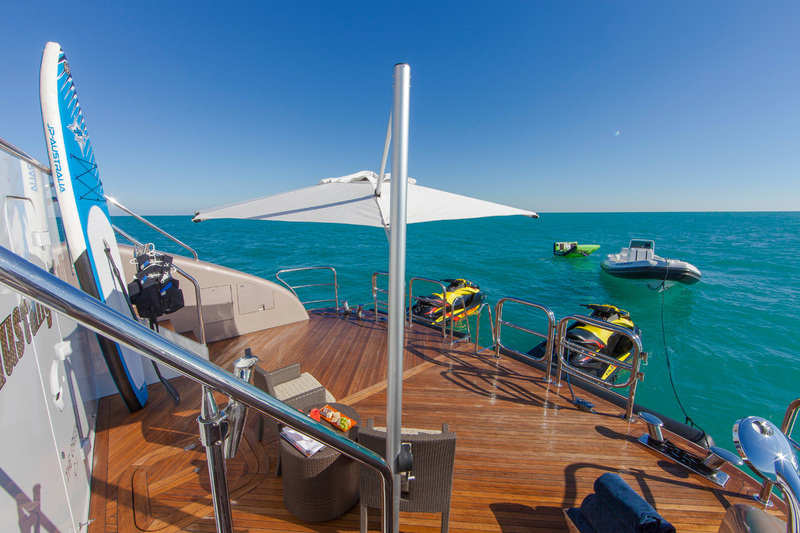 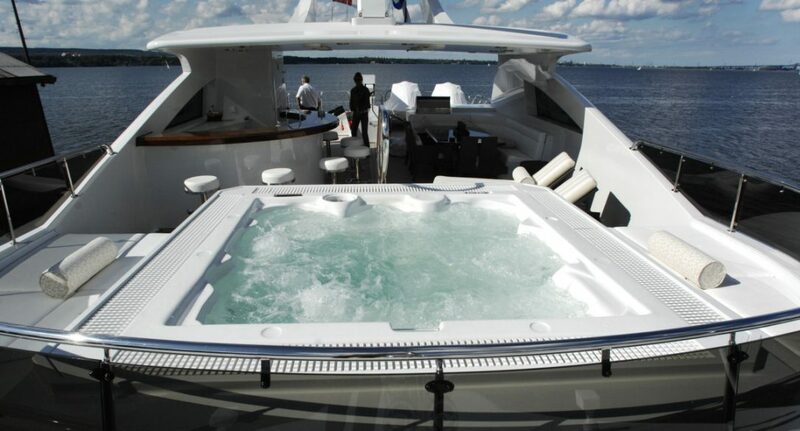 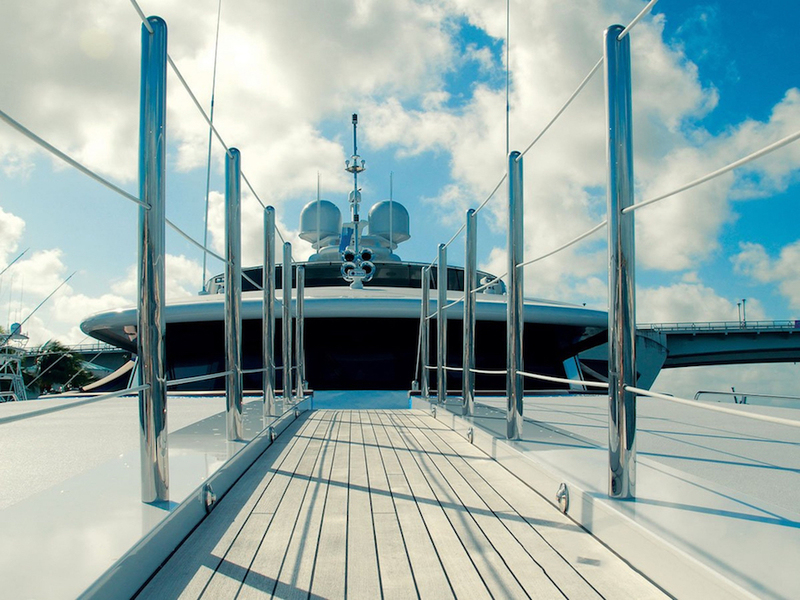 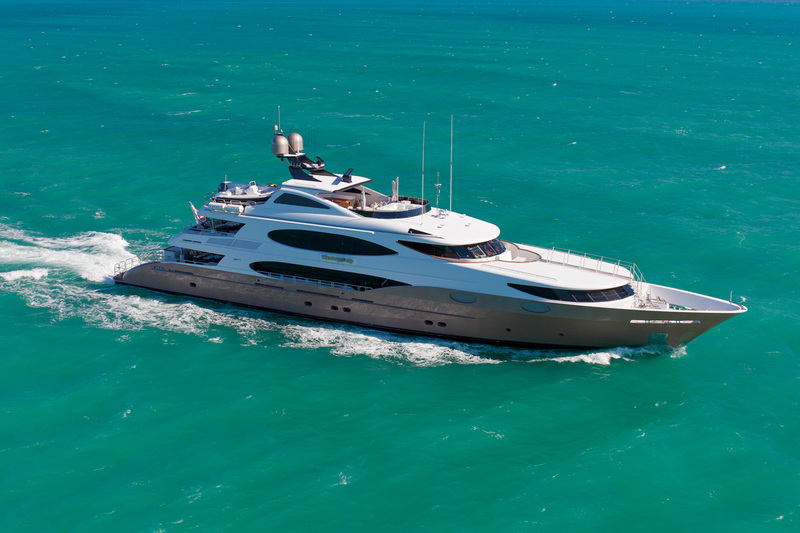 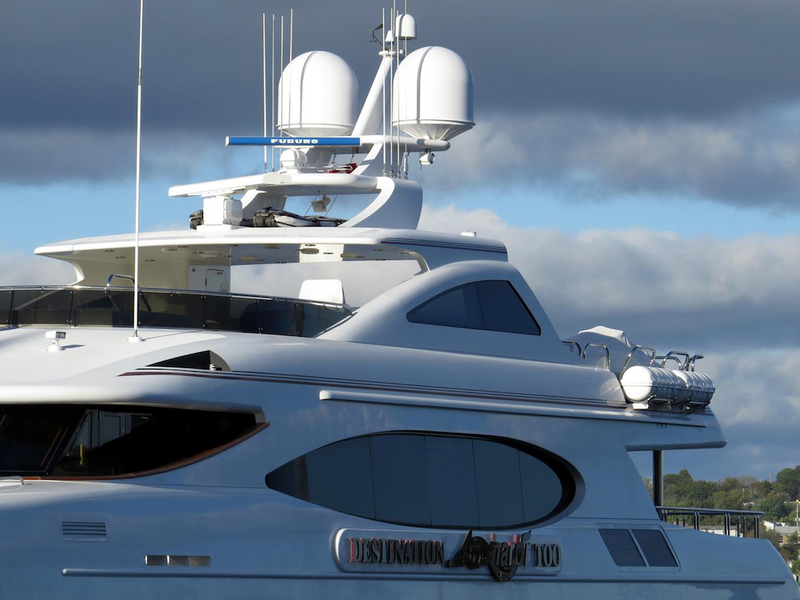 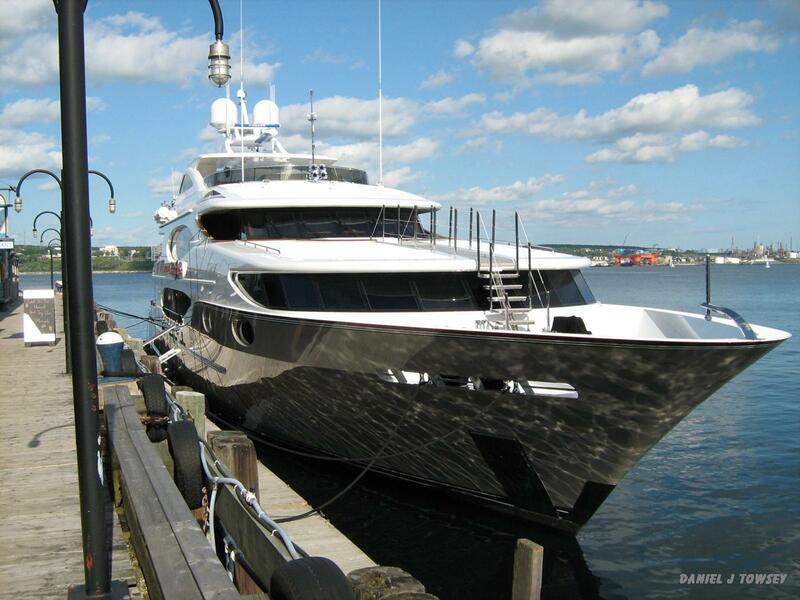 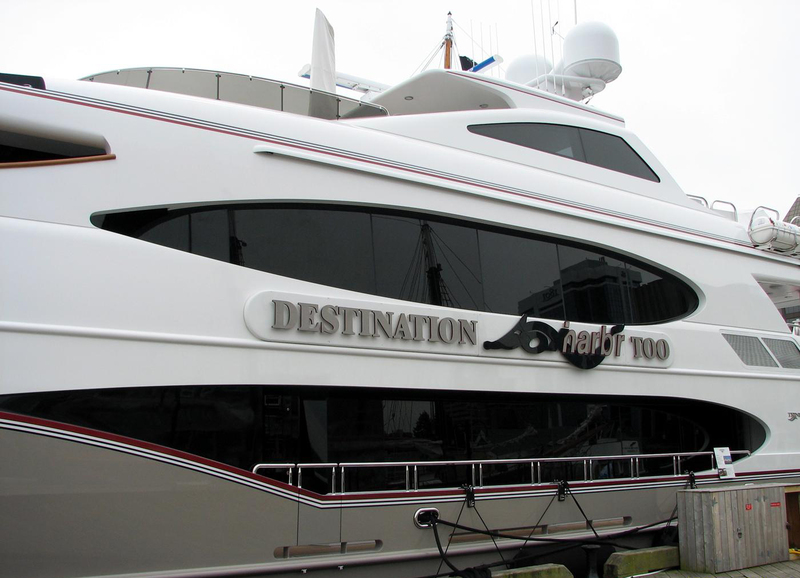 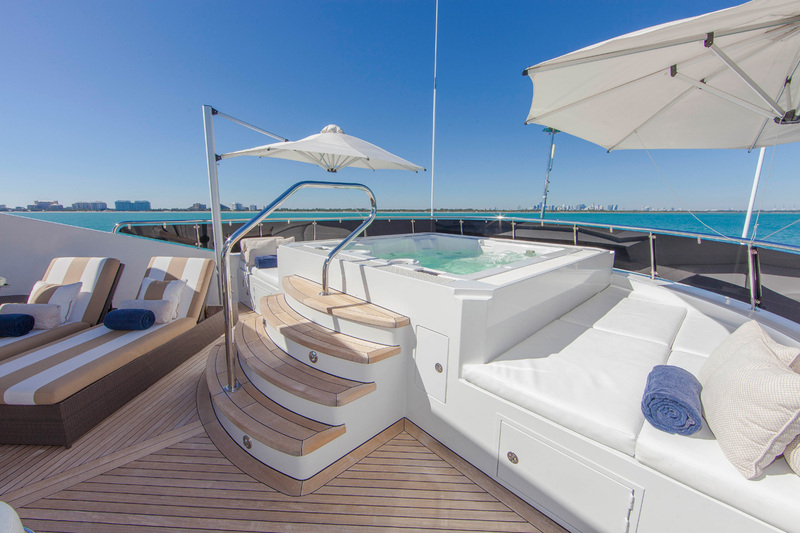 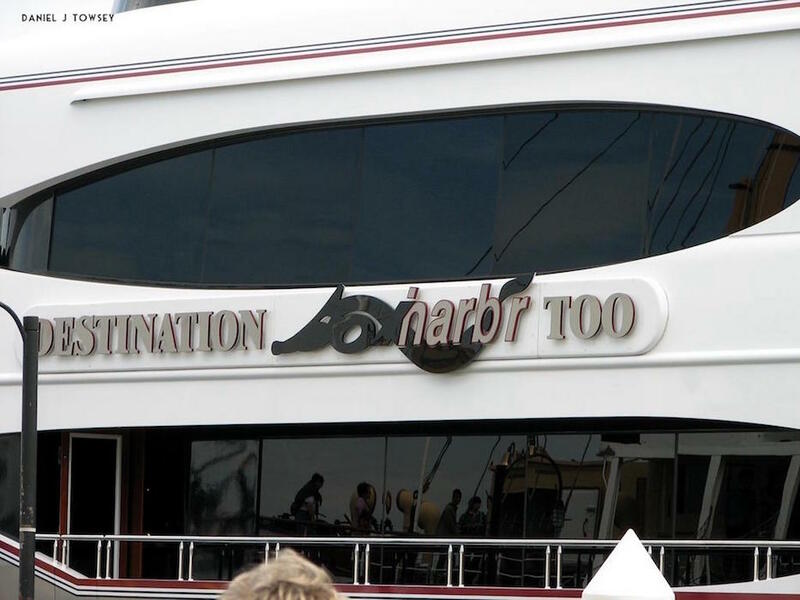 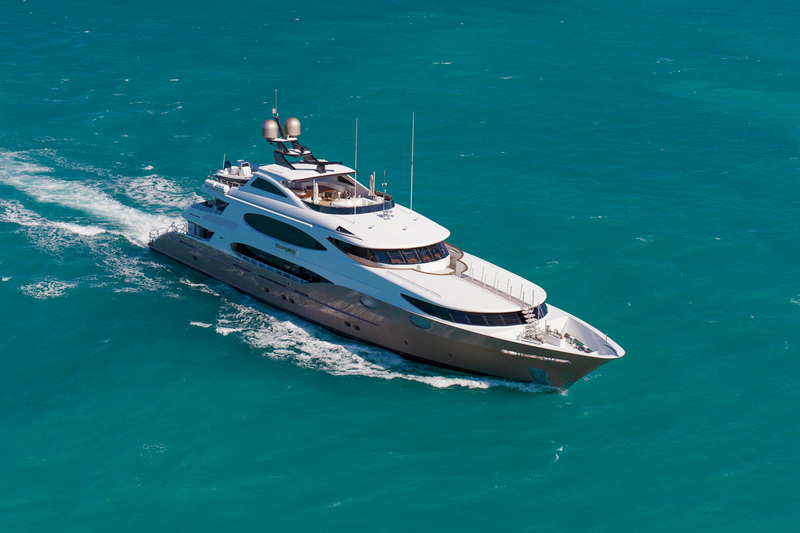 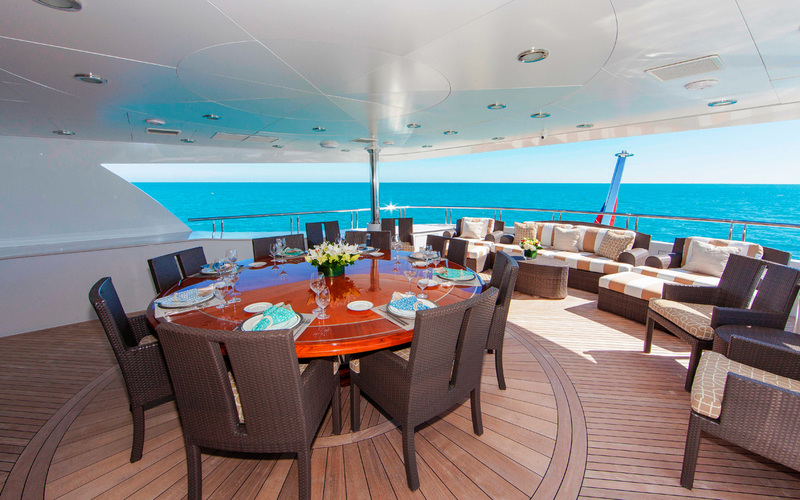 The aft deck is covered, with casual seating, and full wet bar with bar seating. 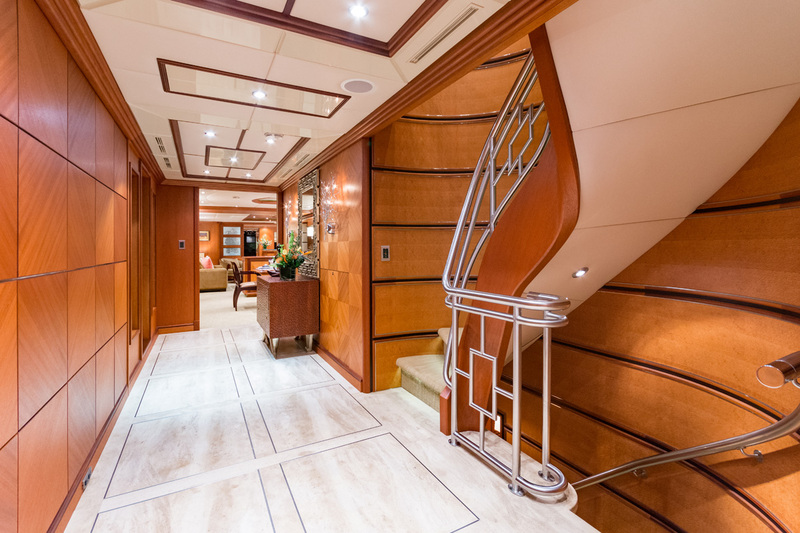 There are port and starboard access to the swim platform, and stairwell to bridge deck. 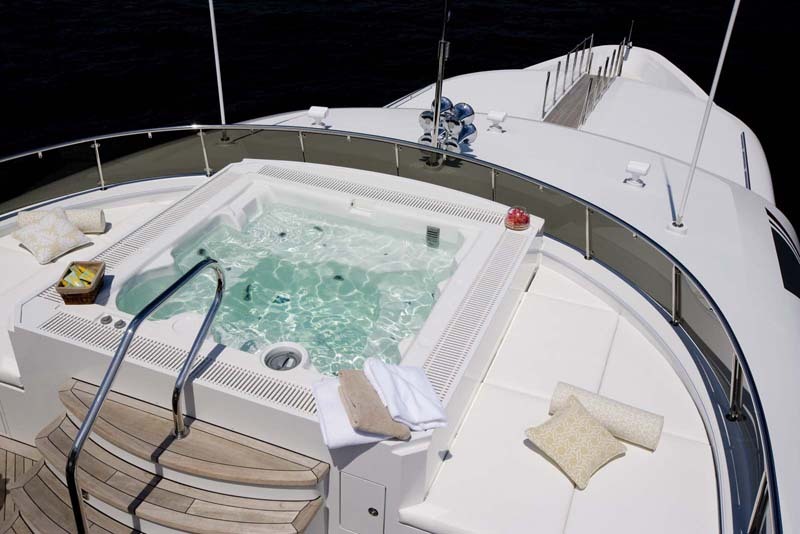 The swimming platform is large, functional and has underwater lights for evening marine entertainment. 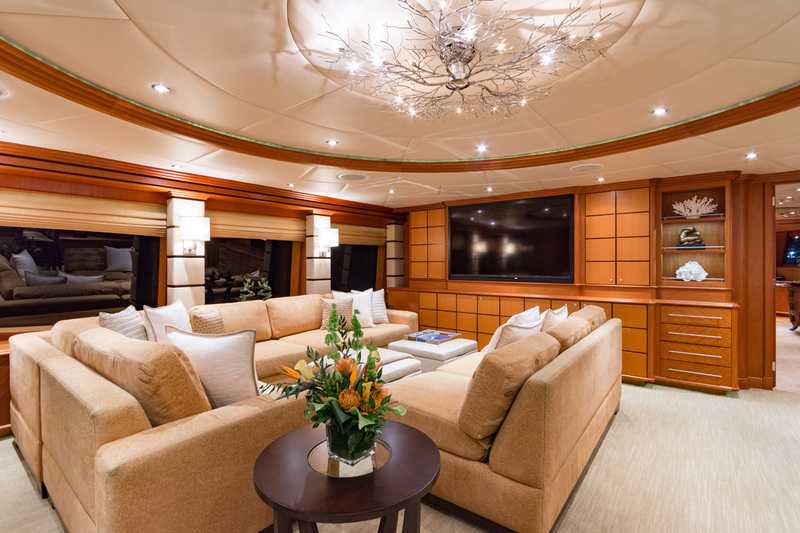 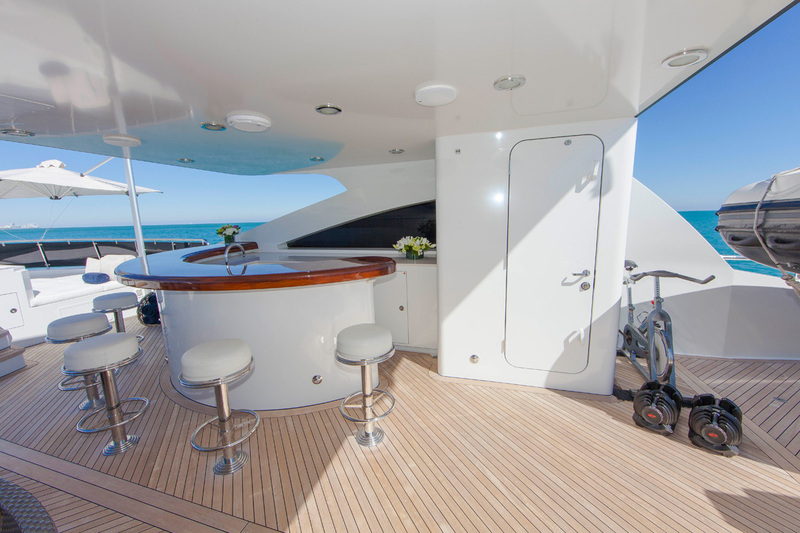 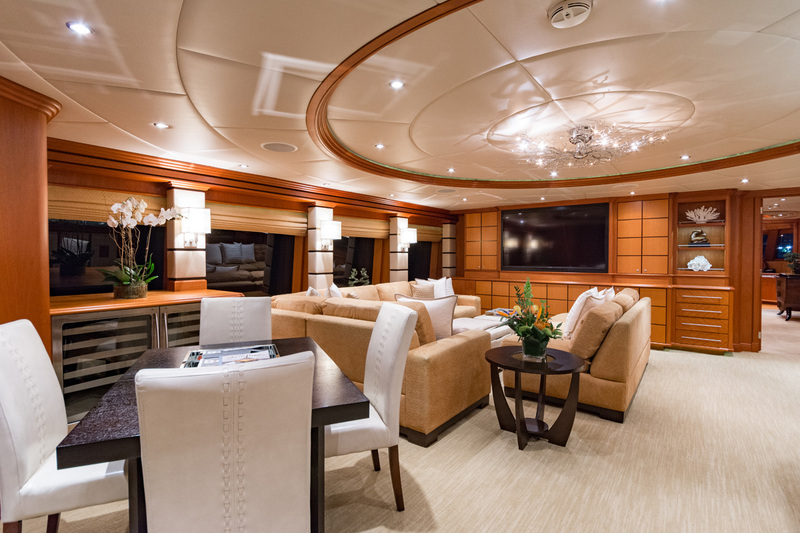 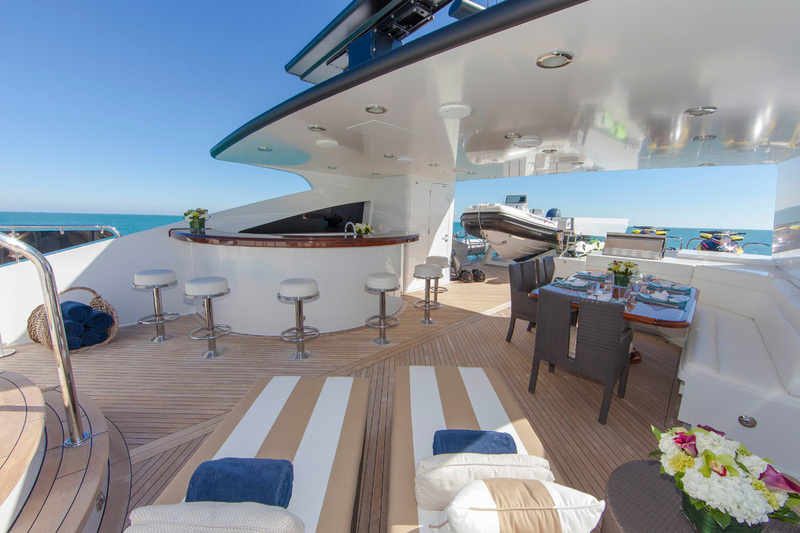 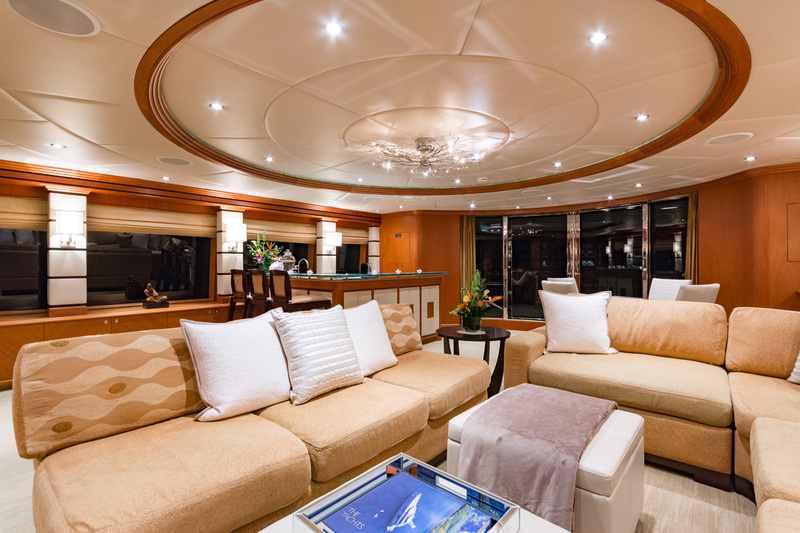 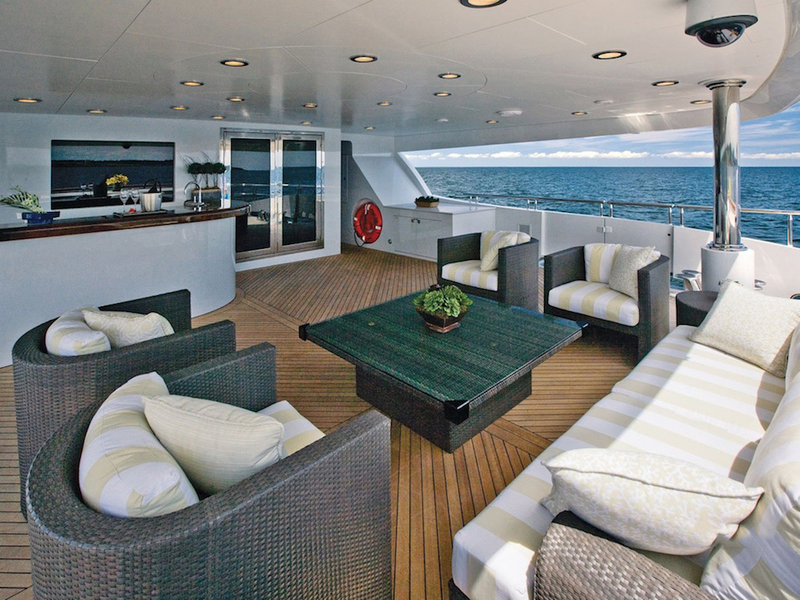 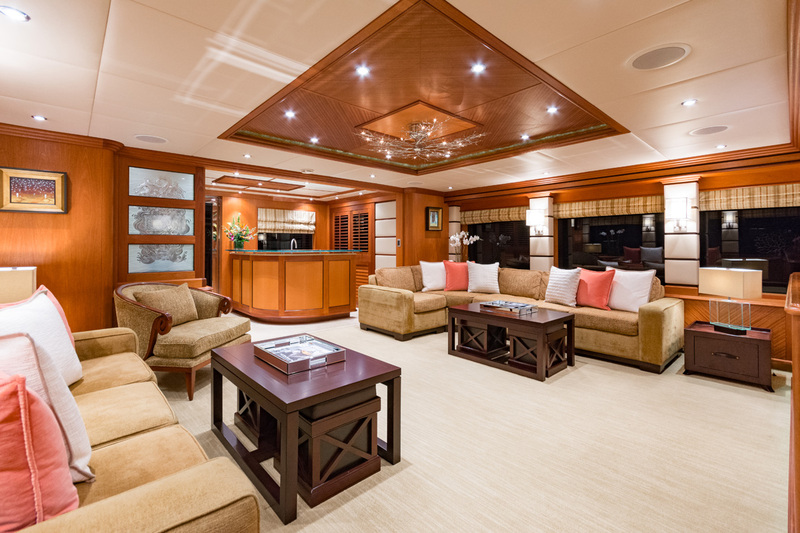 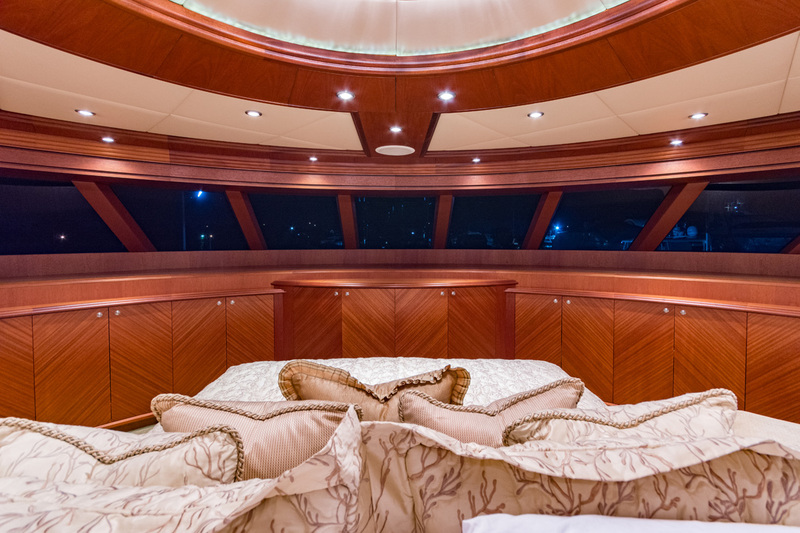 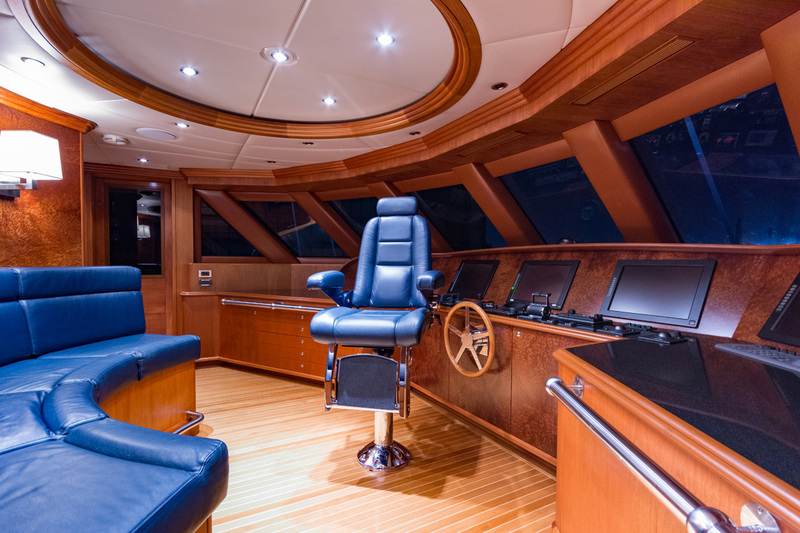 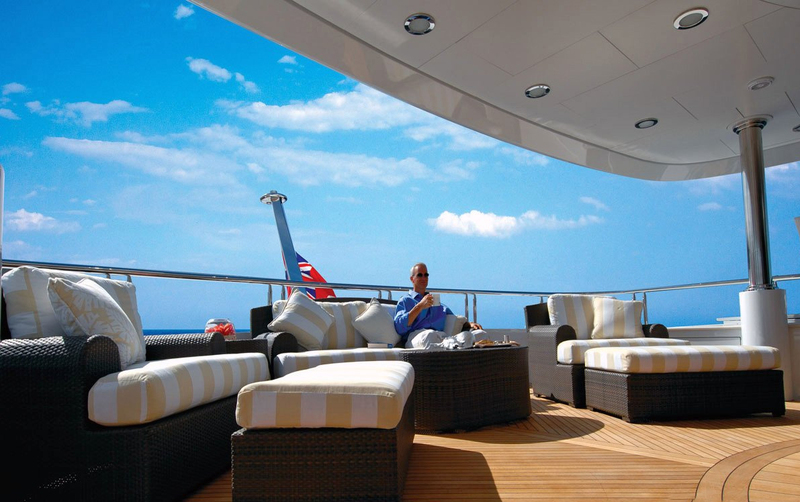 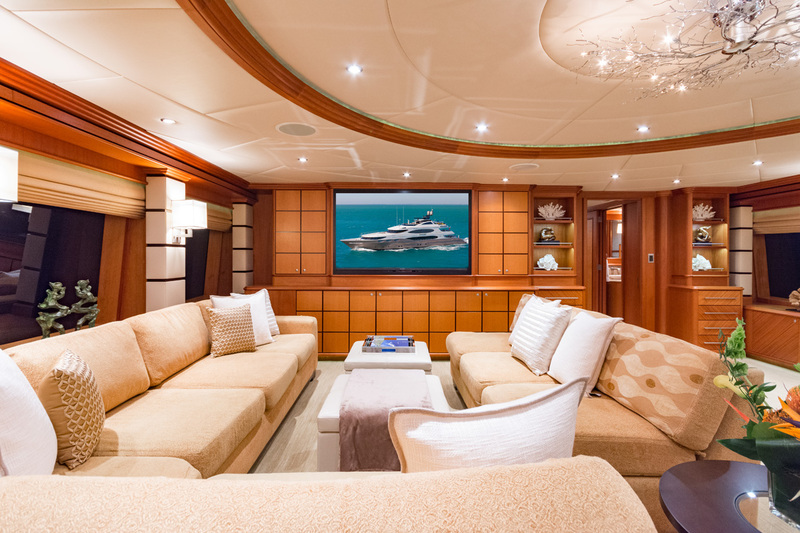 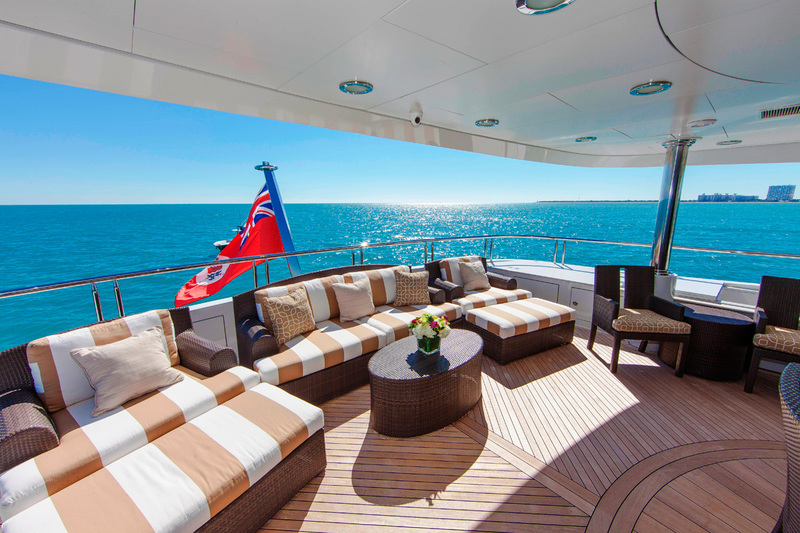 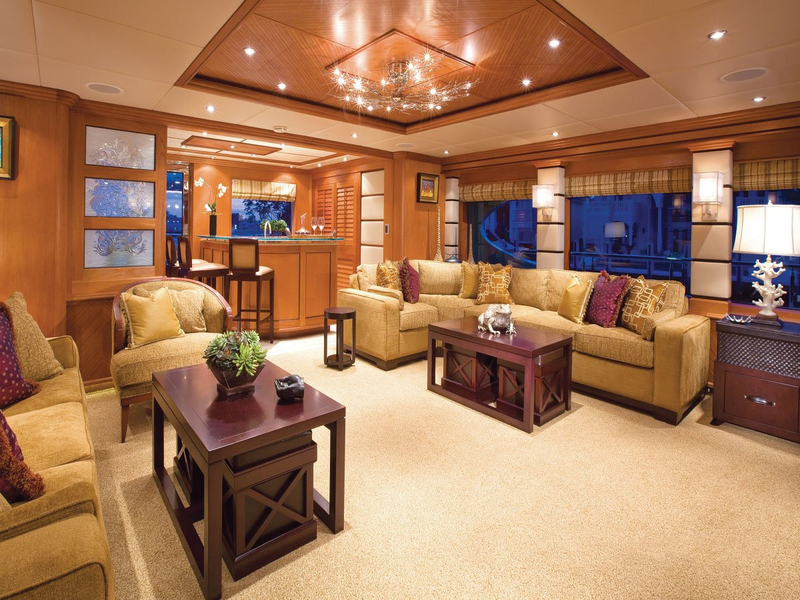 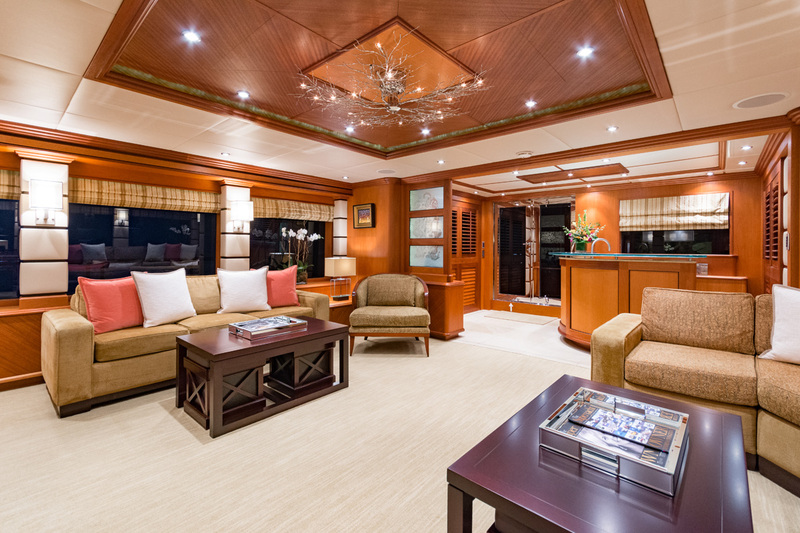 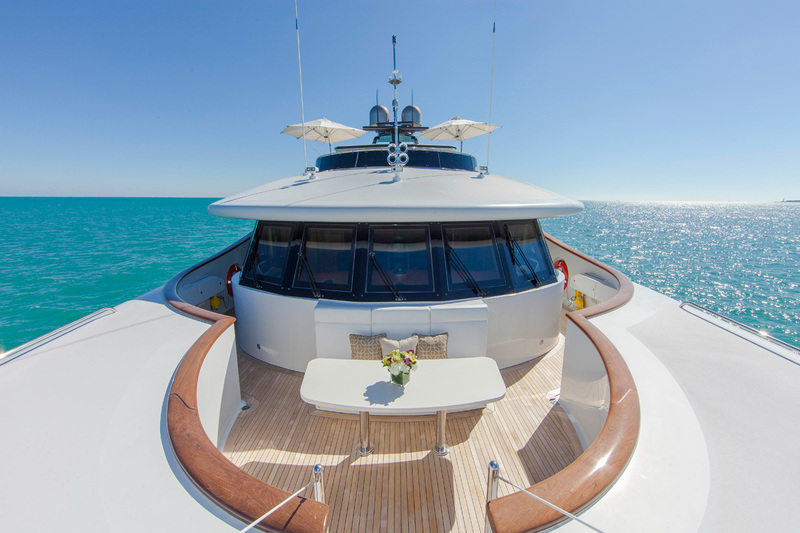 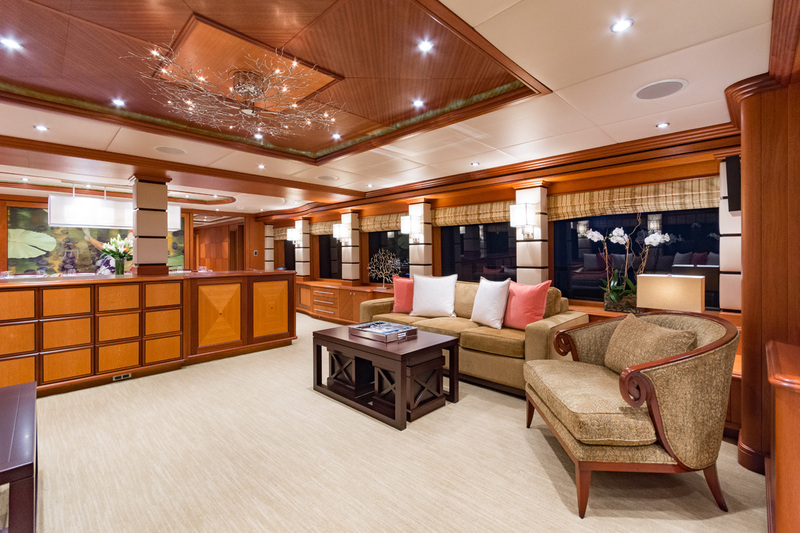 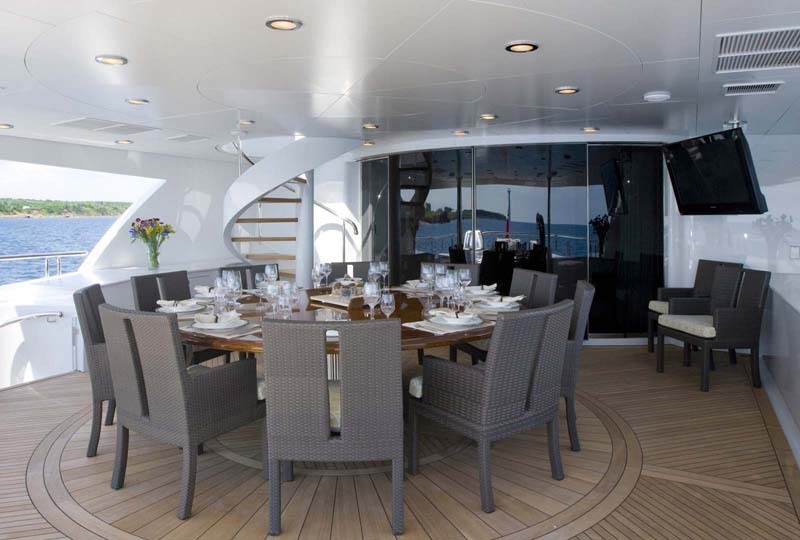 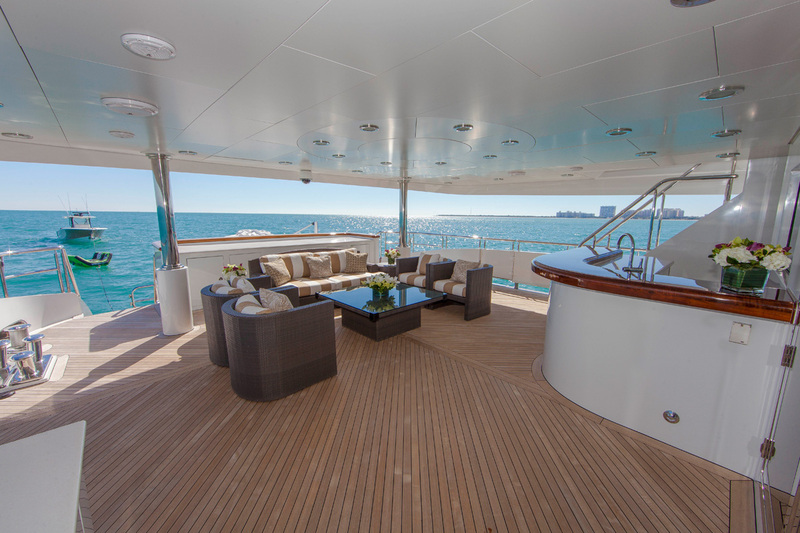 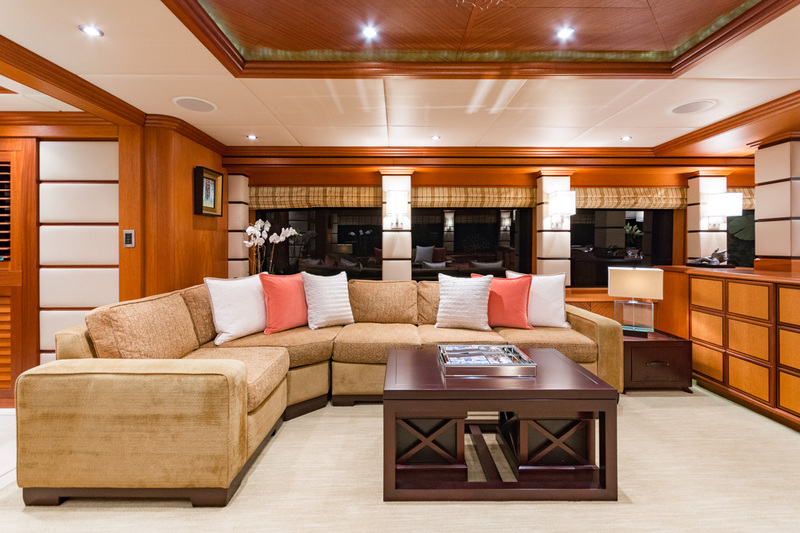 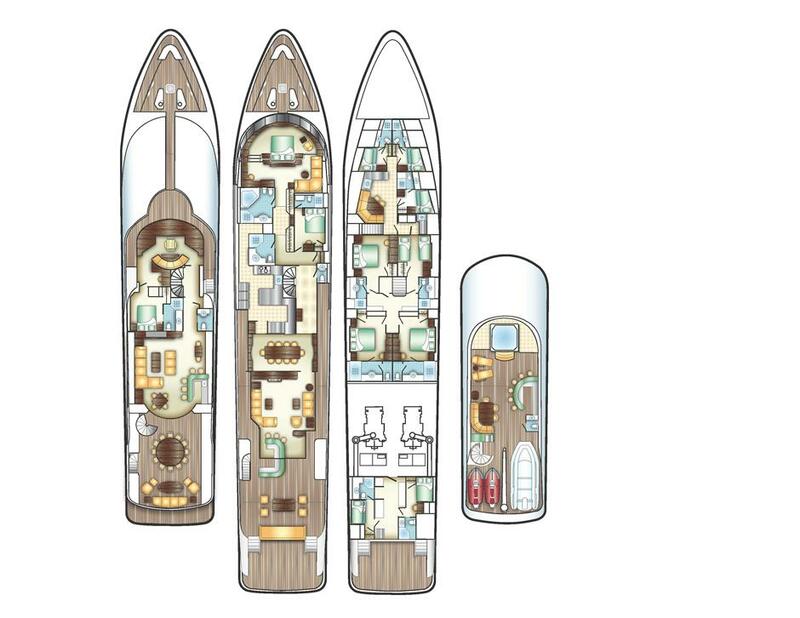 The yacht’s bridge deck is semi-shaded with a large round dining table where there is access to the boat deck. 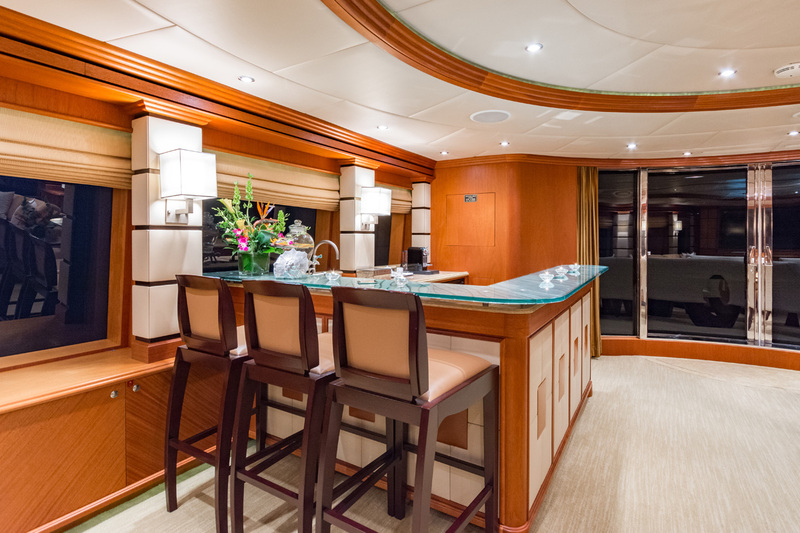 The skylounge has a full bar with bar stool seating, lounge area, game table, library, 62” flat screen TV with DVD, and individual satellite receiver. 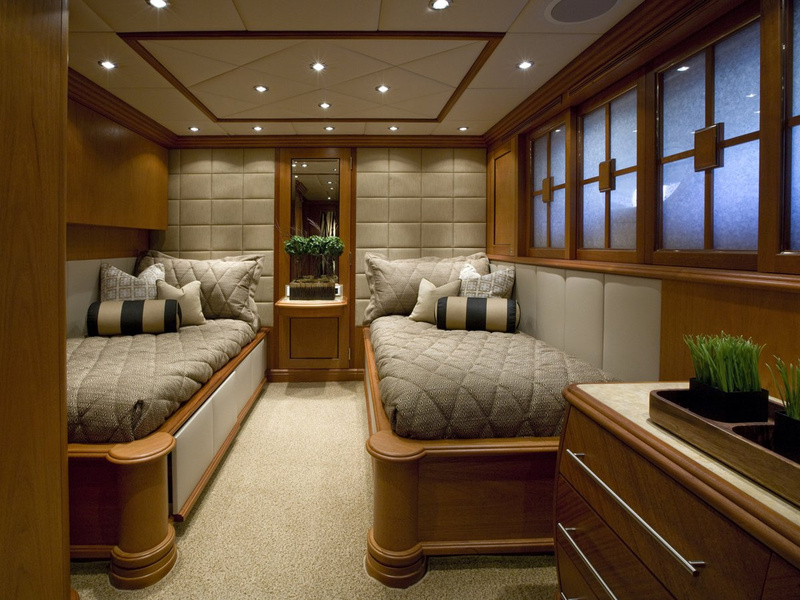 There is another Day head to starboard. 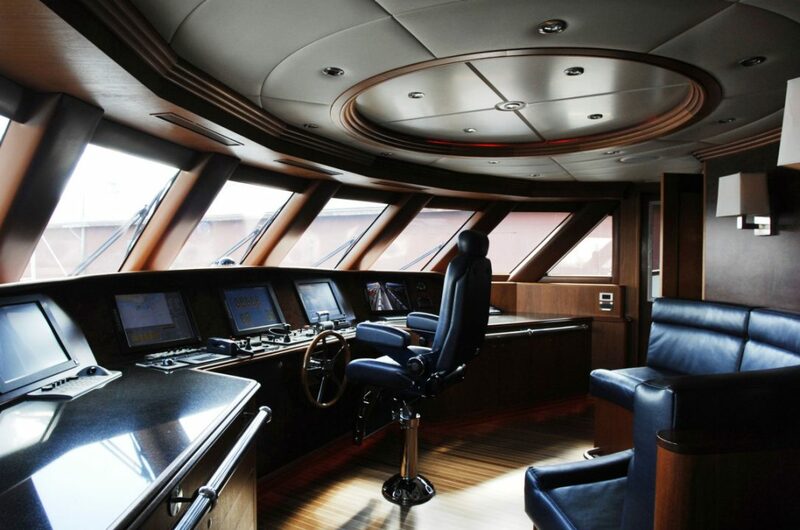 The bridge is forward with access to Portuguese deck. 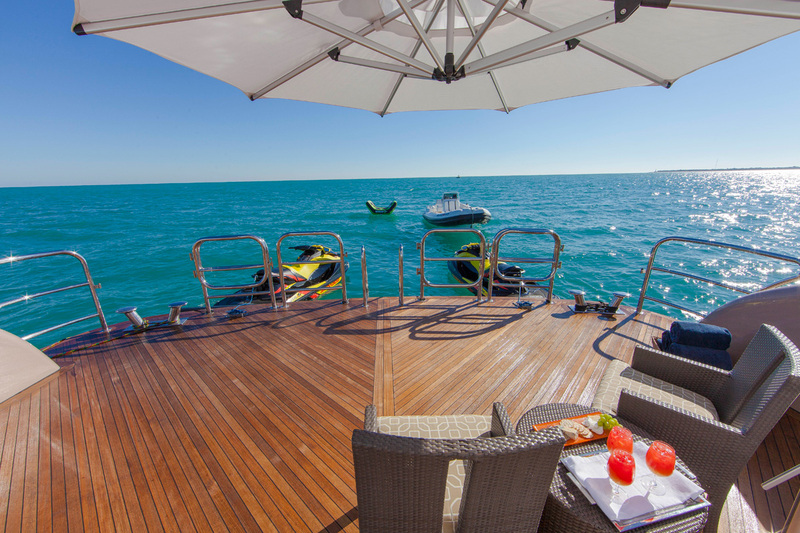 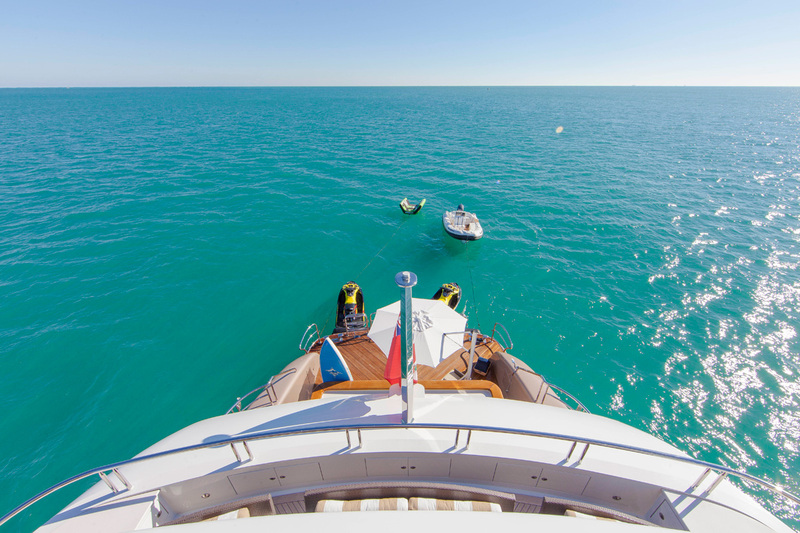 The boat deck is Semi-shaded and boasts a Spa Pool for 6/8 guests which is surrounded with large sunning pads, full wet bar with bar stools, al fresco dining to port, storage for tender and wave runners. 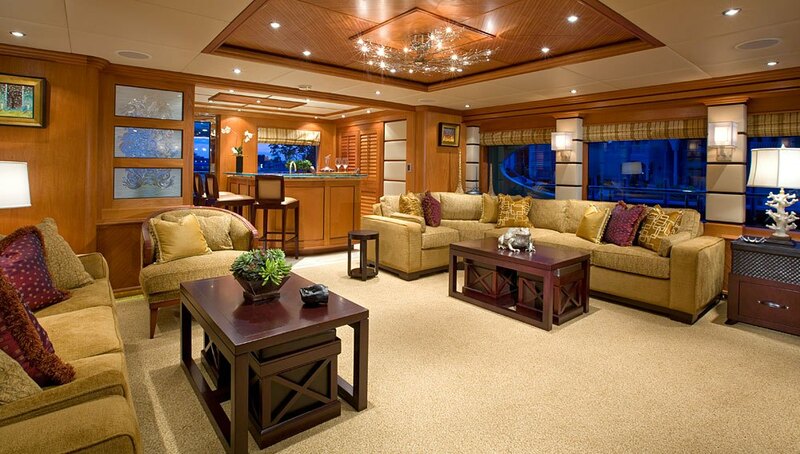 There are 2 chaise lounges and another day head. 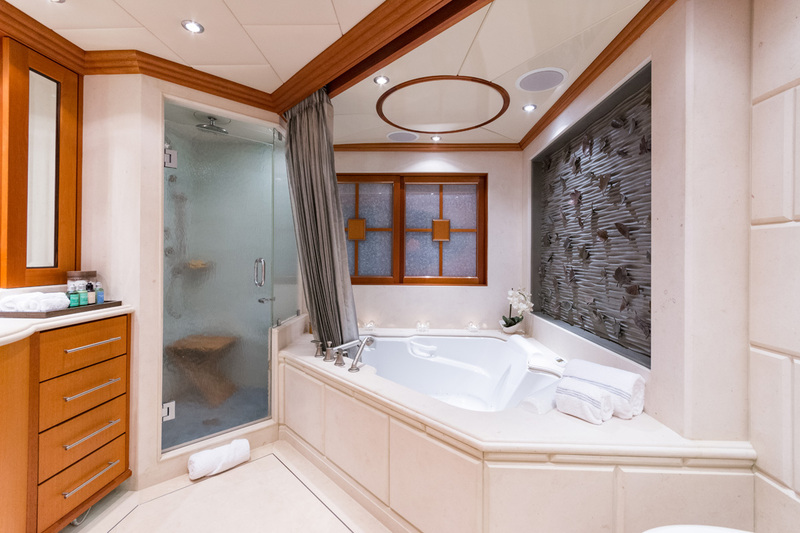 On deck, forward, full beam owner’s stateroom: As you enter the Owner’s area, there is a private office to starboard with a queen size sleeper sofa, with private en-suite head and shower. 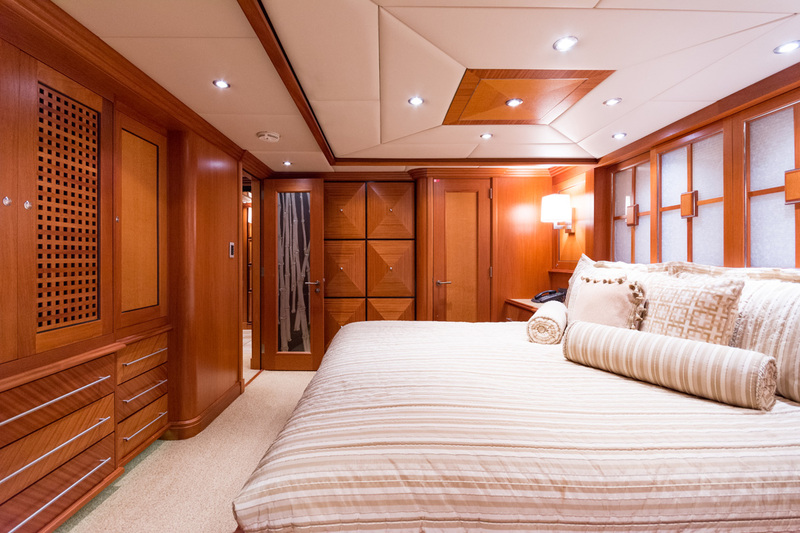 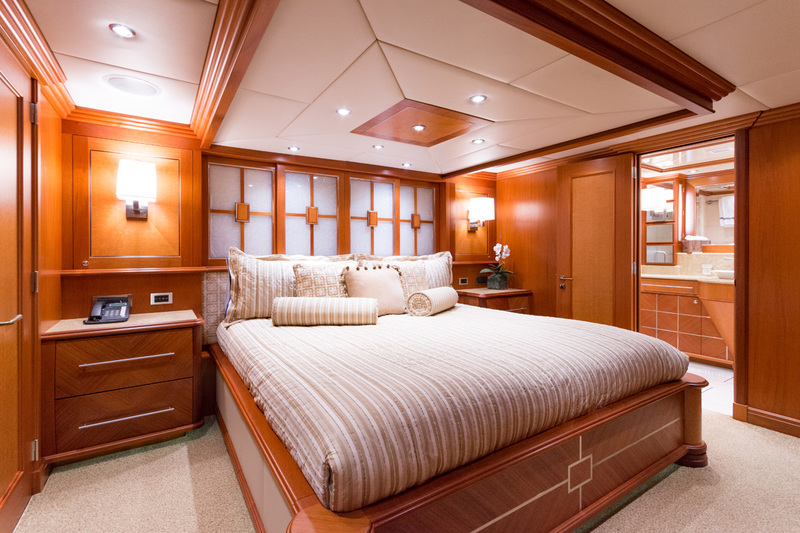 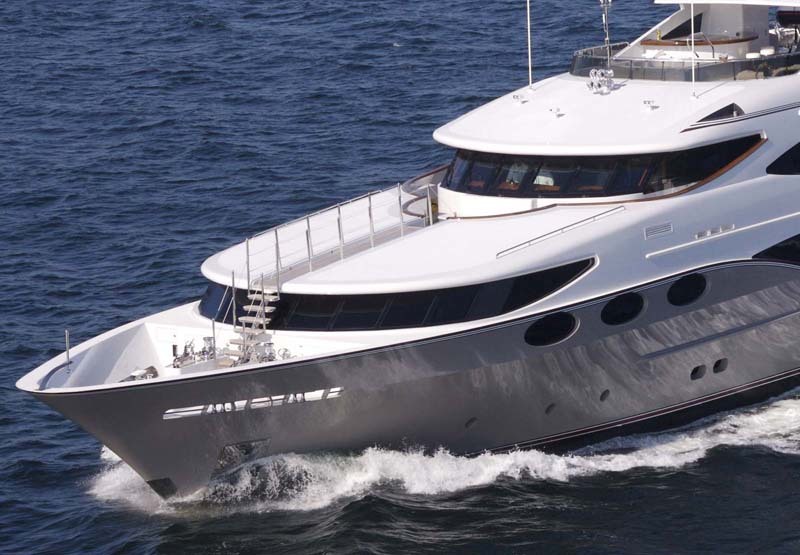 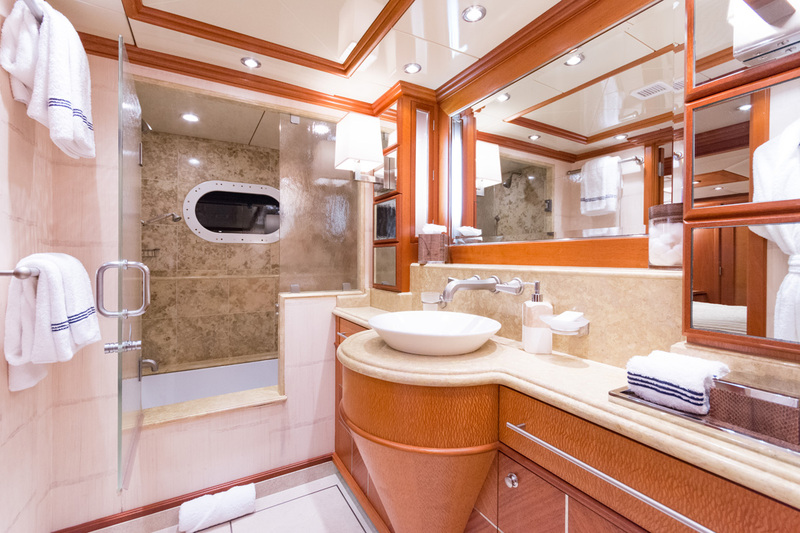 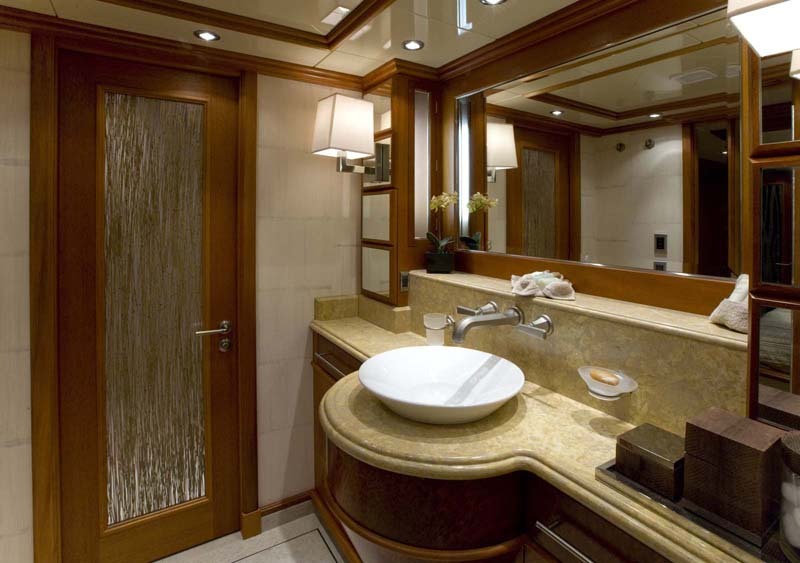 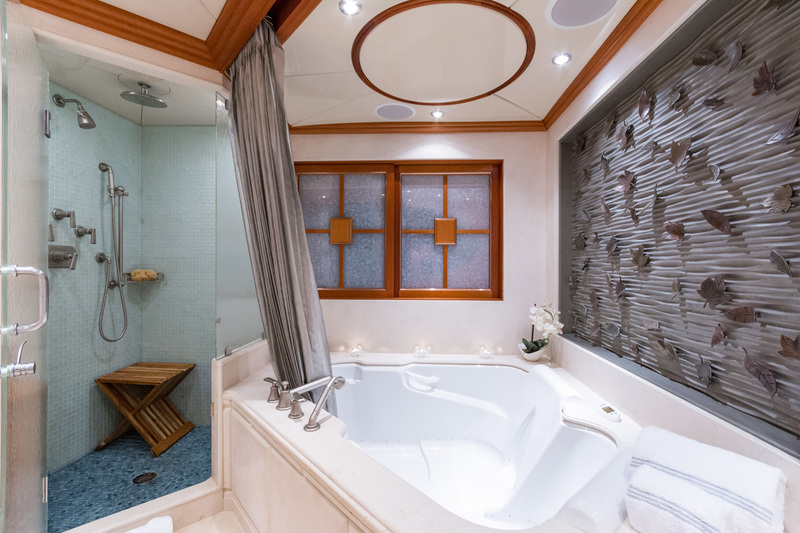 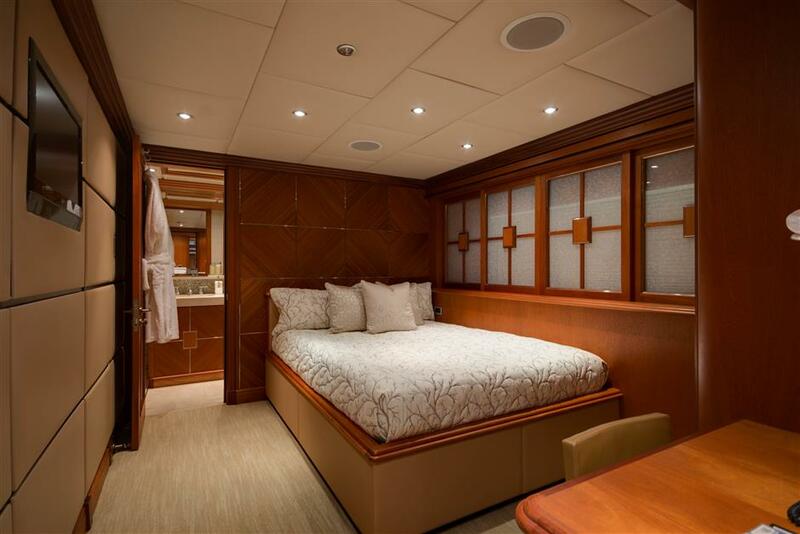 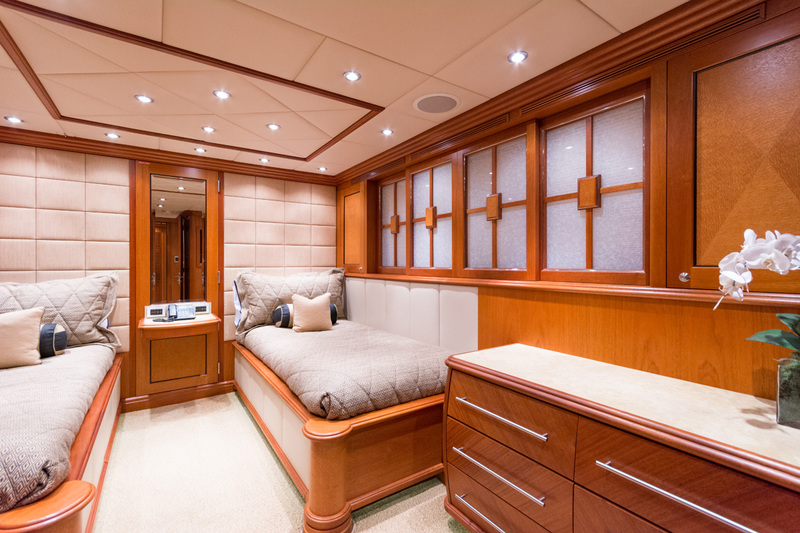 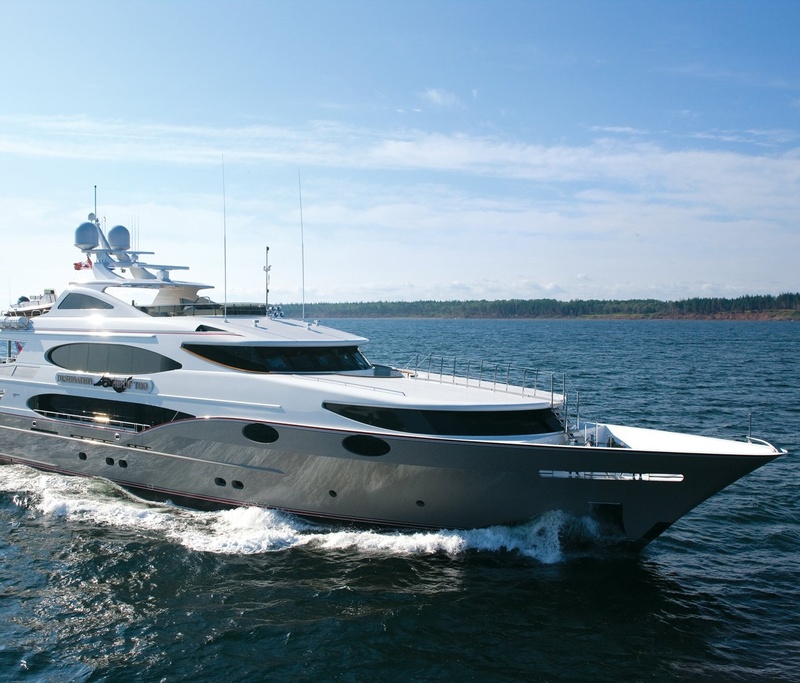 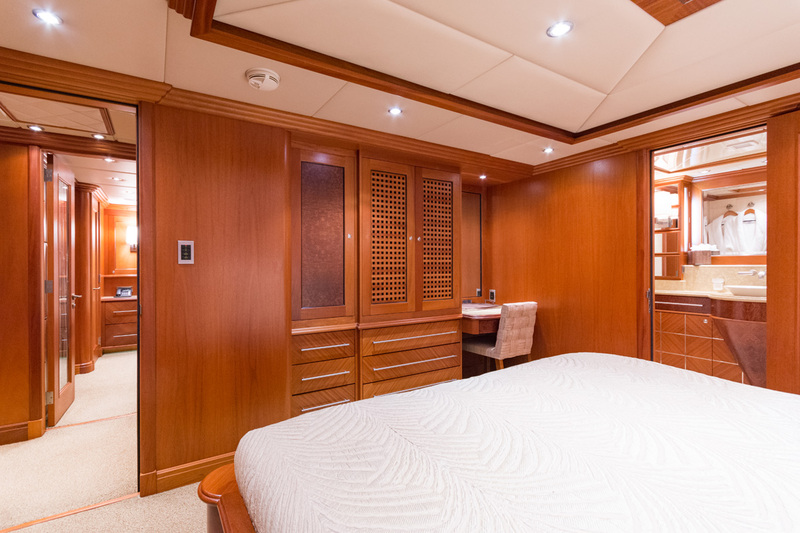 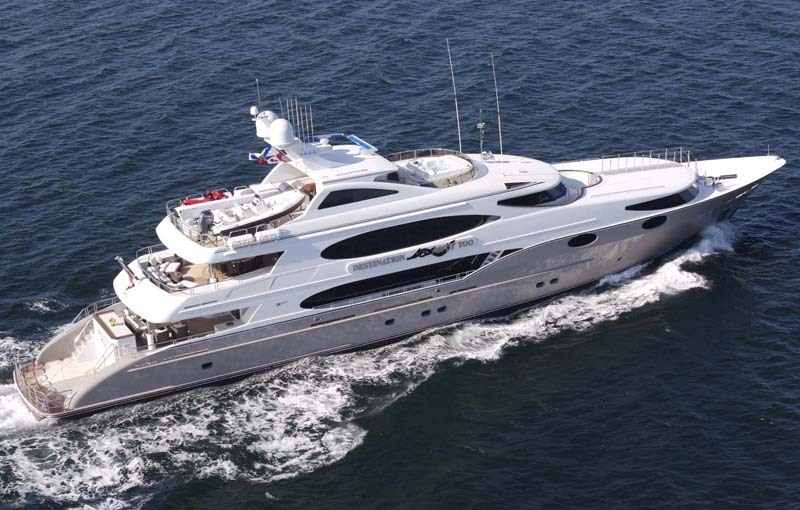 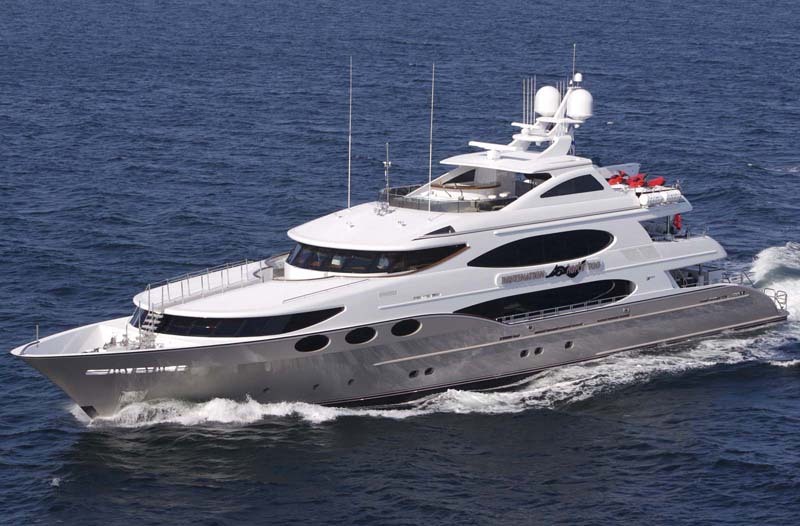 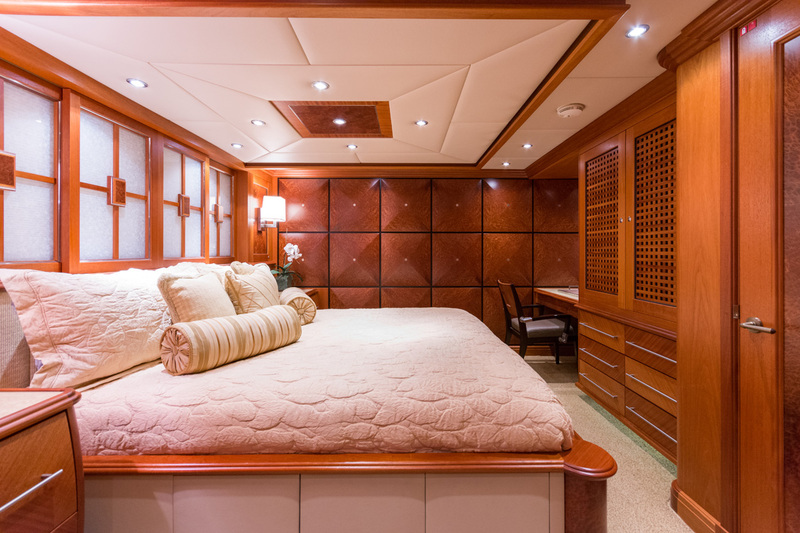 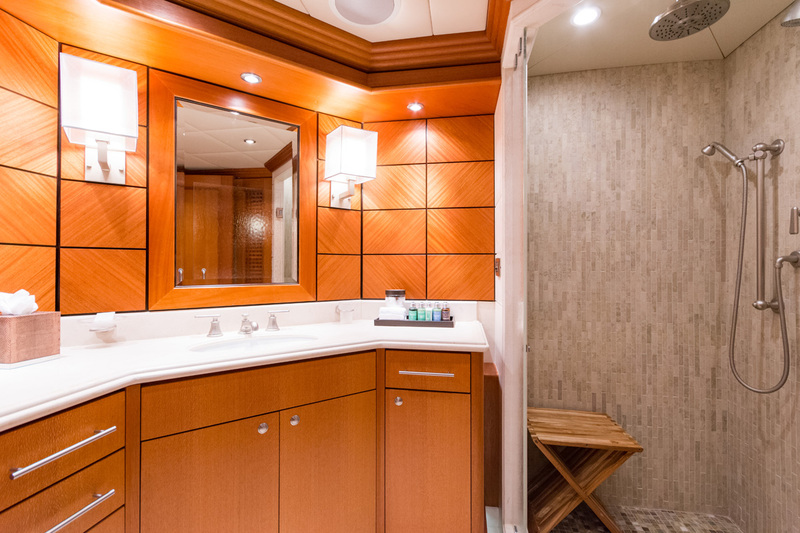 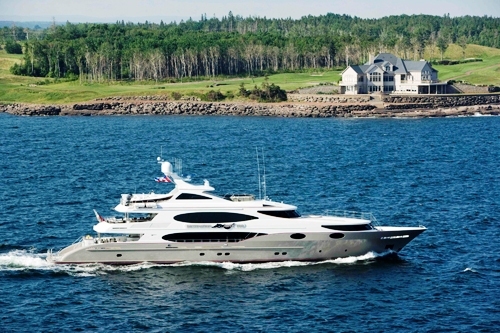 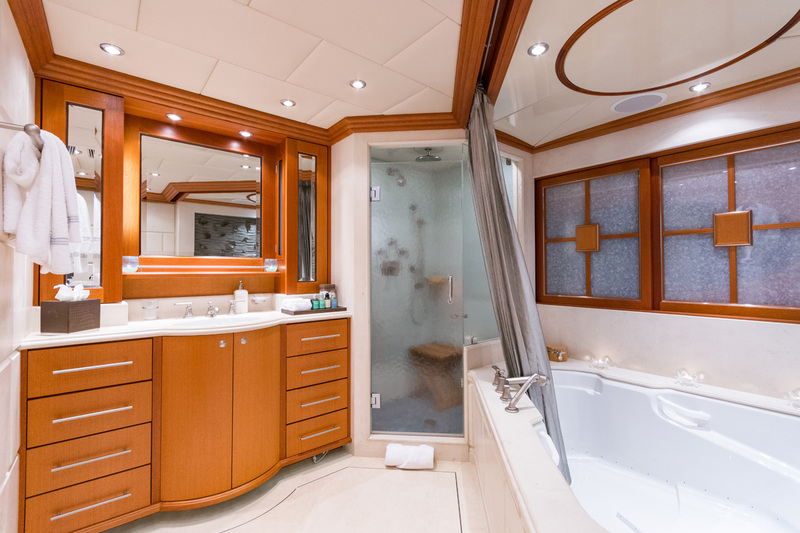 His en-suite featuring a shower, head, and sink is situated to starboard, with her en-suite featuring a Spa Pool tub, bidet, head, sink, and shower situated directly forward. 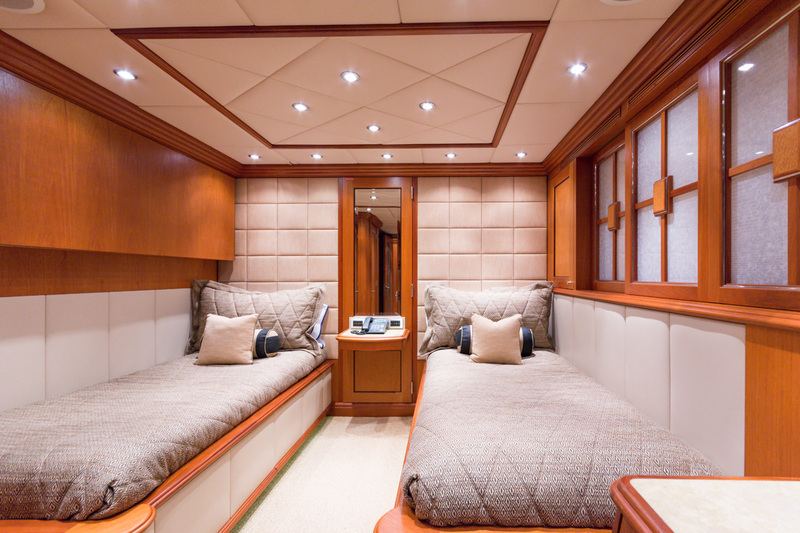 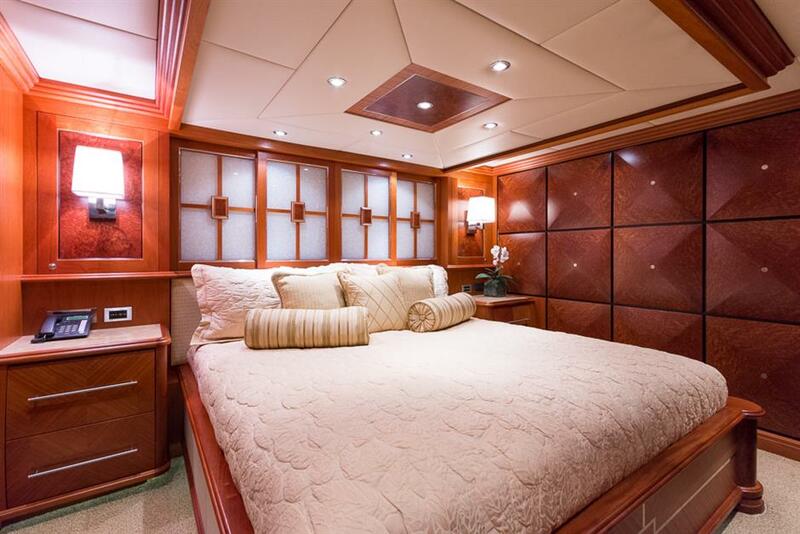 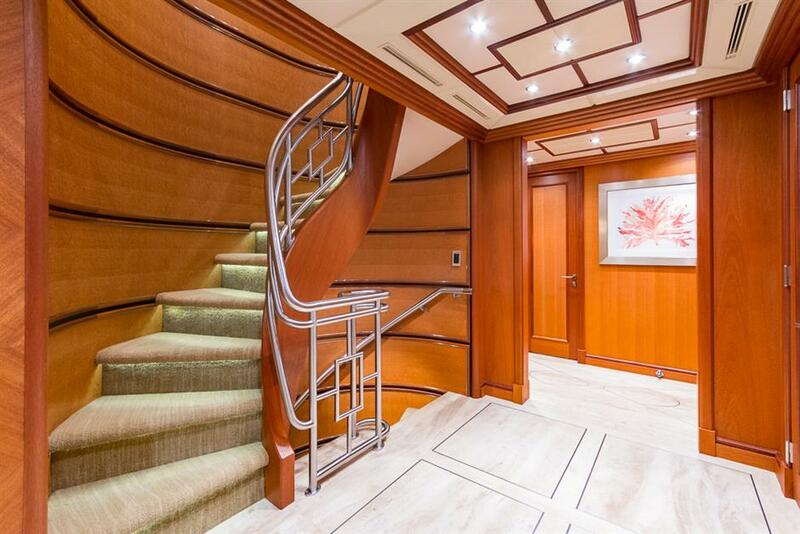 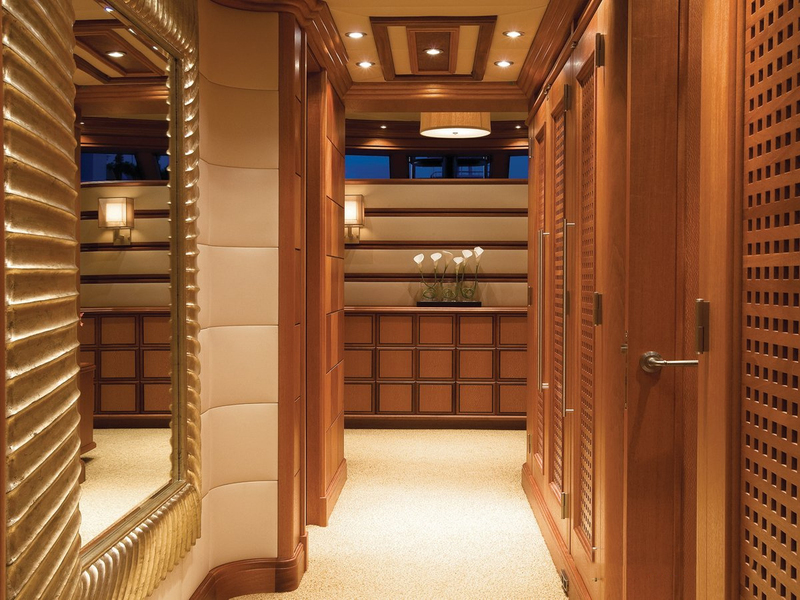 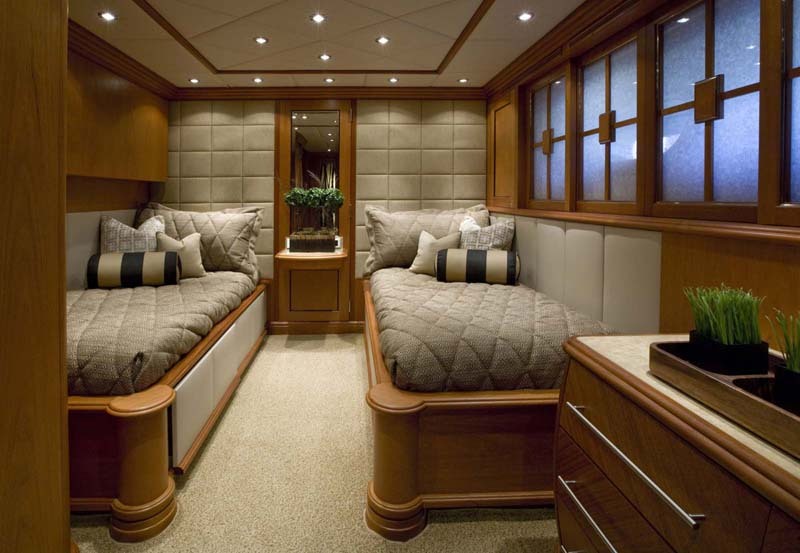 Proceeding forward, there is a grand entrance to the Master Stateroom with settee to port and a vanity to starboard. 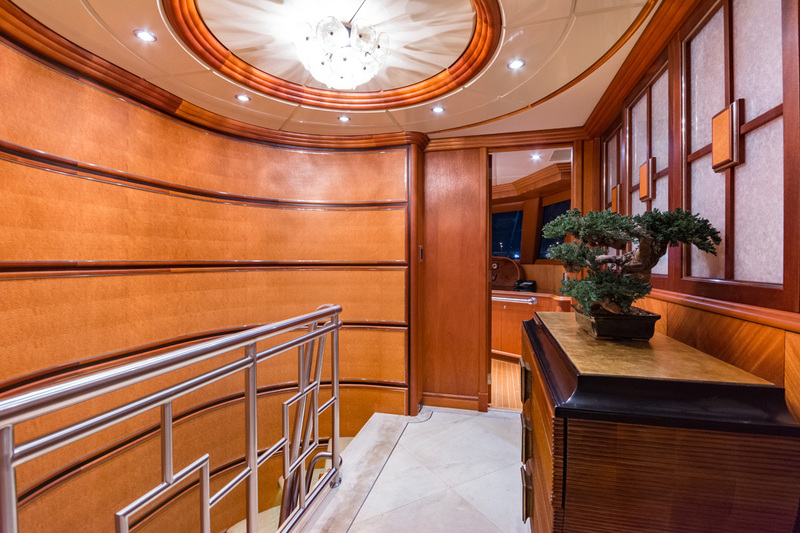 Two stairs up to port access the walk-around king bed facing forward with panoramic views. 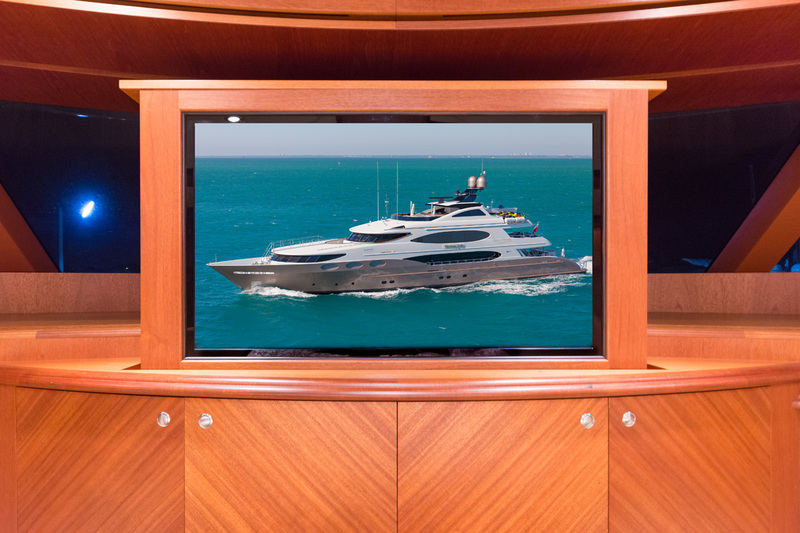 The entertainment system consists of a 42” flat screen TV with DVD, individual satellite receiver, and surround sound. 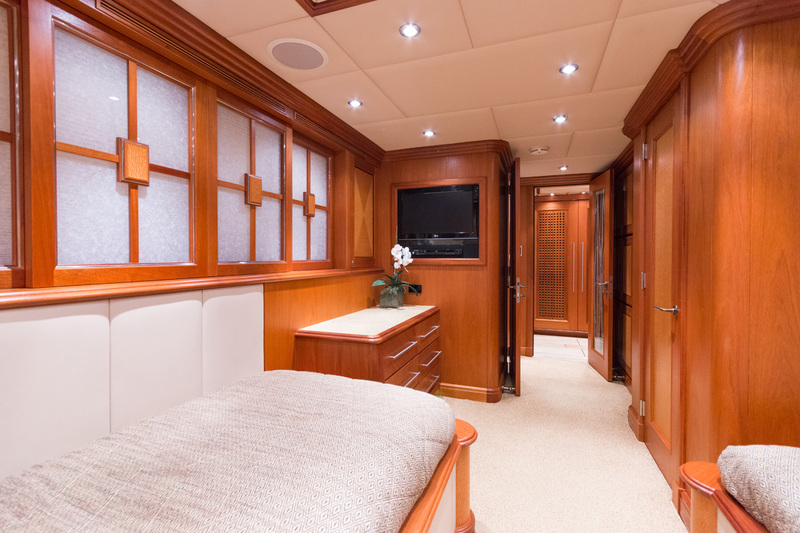 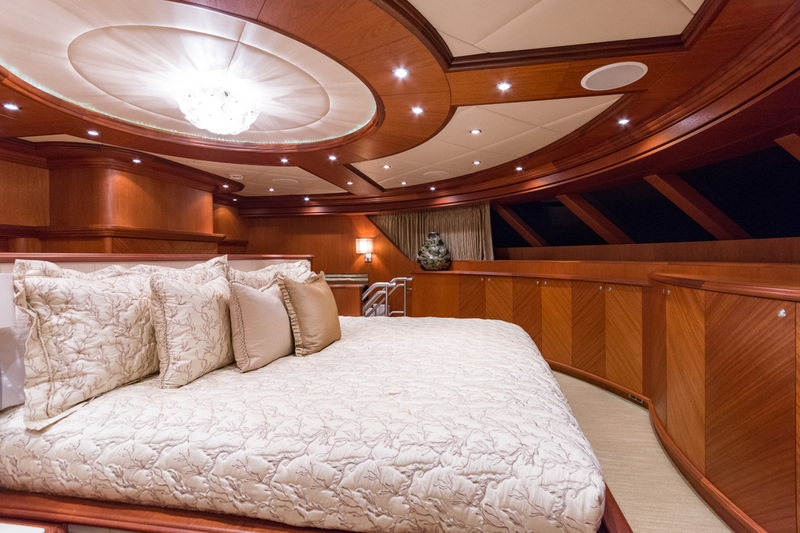 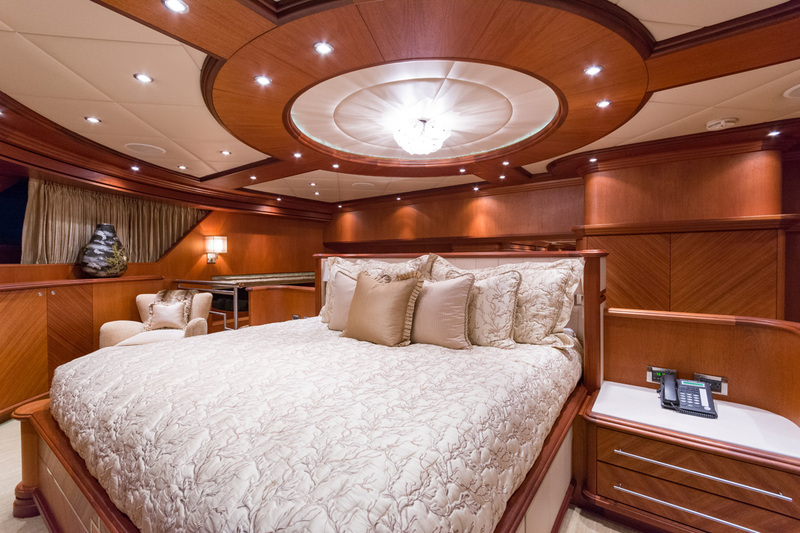 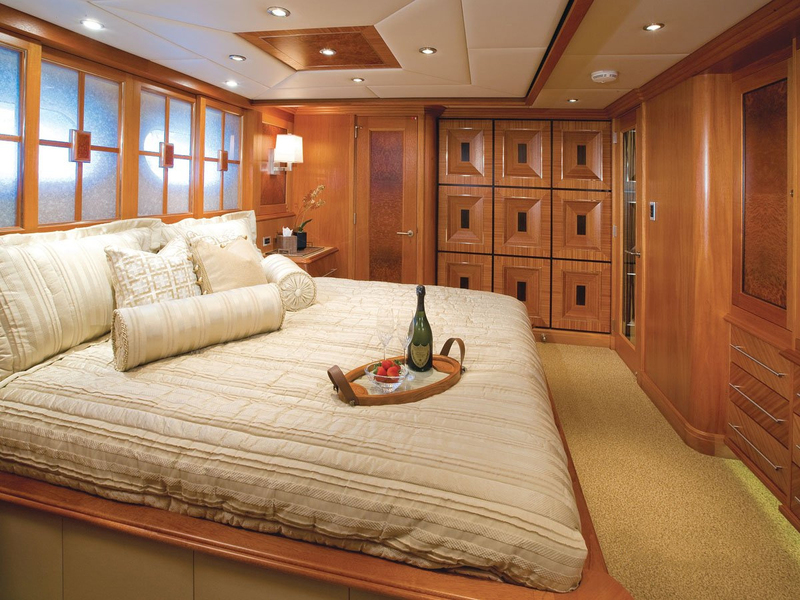 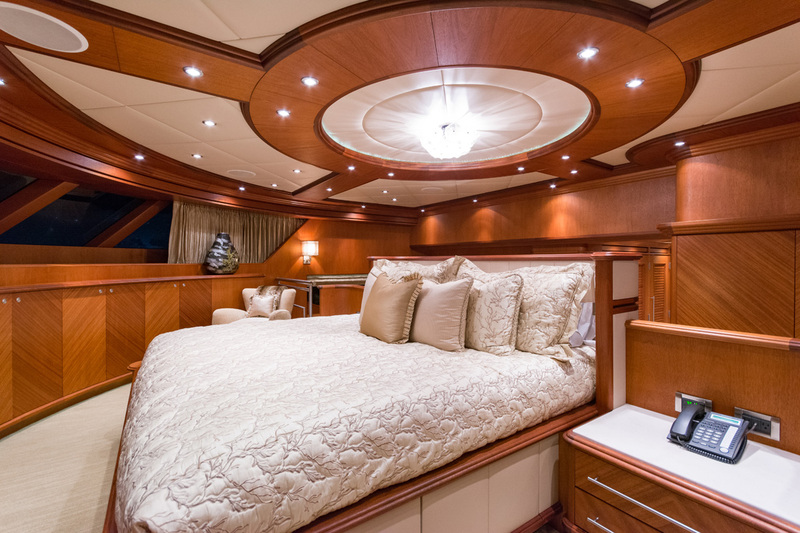 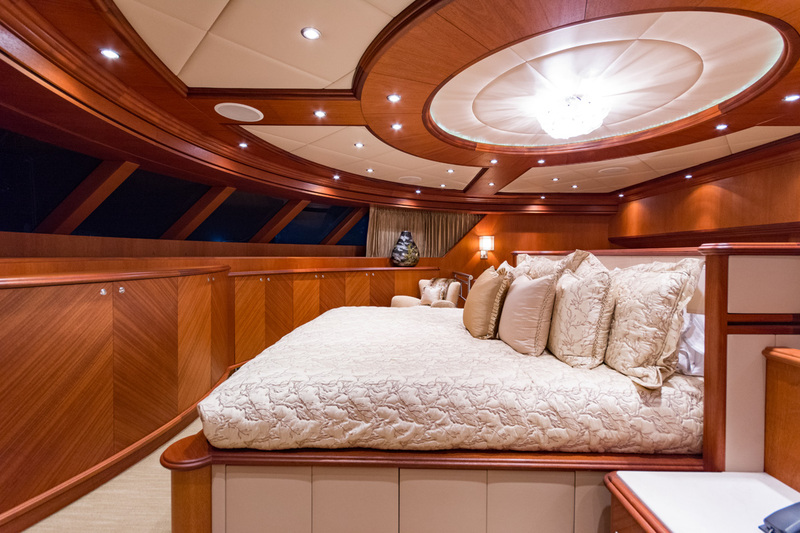 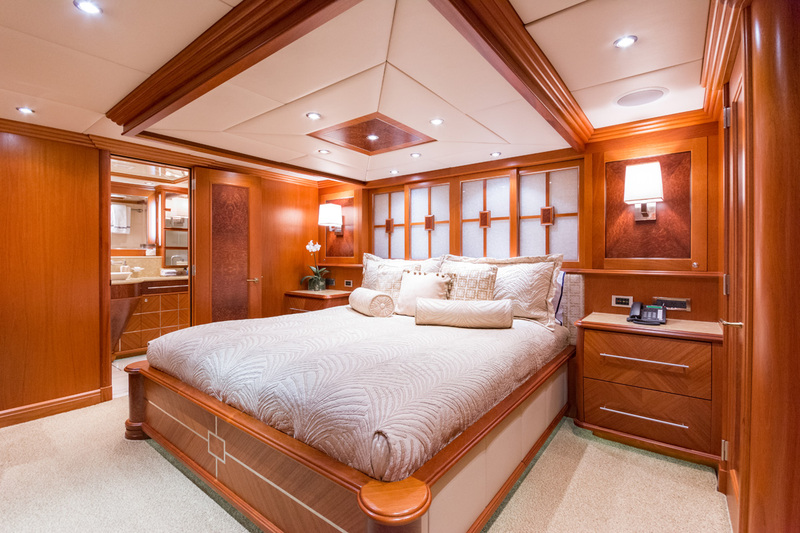 Below deck accommodations: Aft to port: Spacious Stateroom with walk-around king size bed, 26” flat screen TV with DVD, individual satellite receiver, and surround sound. 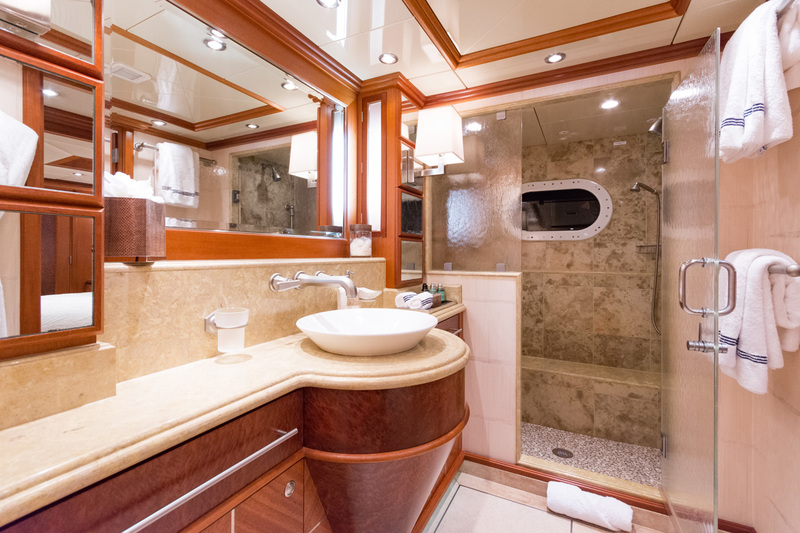 En-suite features head, marble countertop with sink and spacious shower. 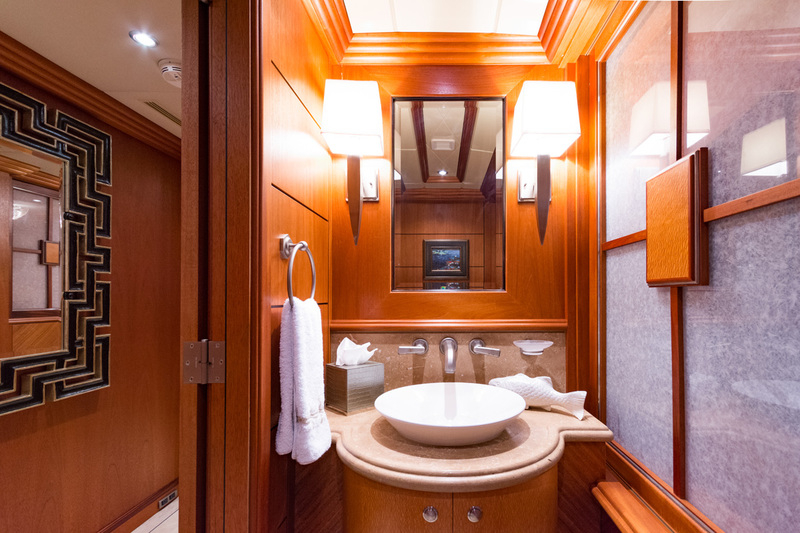 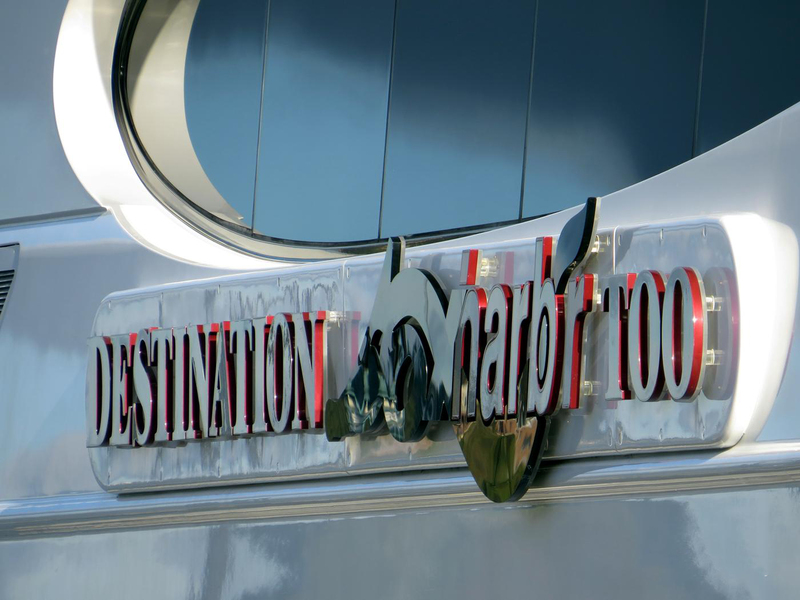 Aft to starboard: Spacious Stateroom with walk-around king size bed, 26” flat screen TV with DVD, individual satellite receiver, and surround sound. 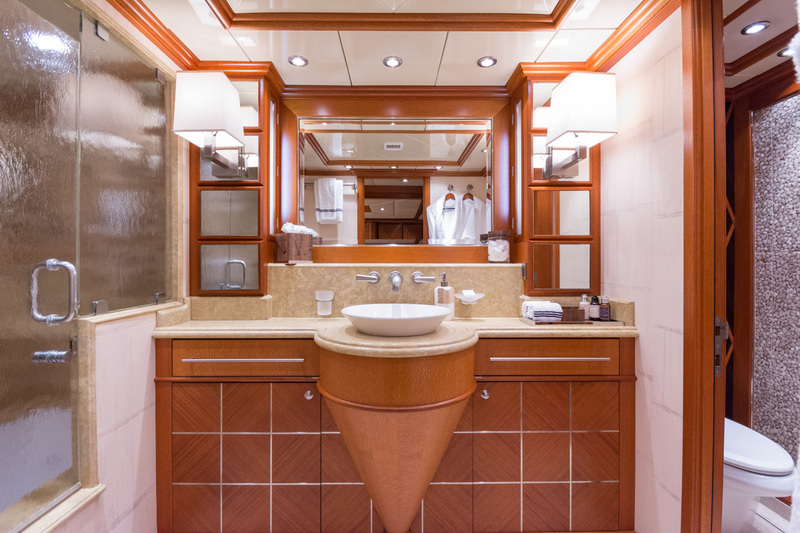 En-suite features head, marble countertop with sink and spacious shower. 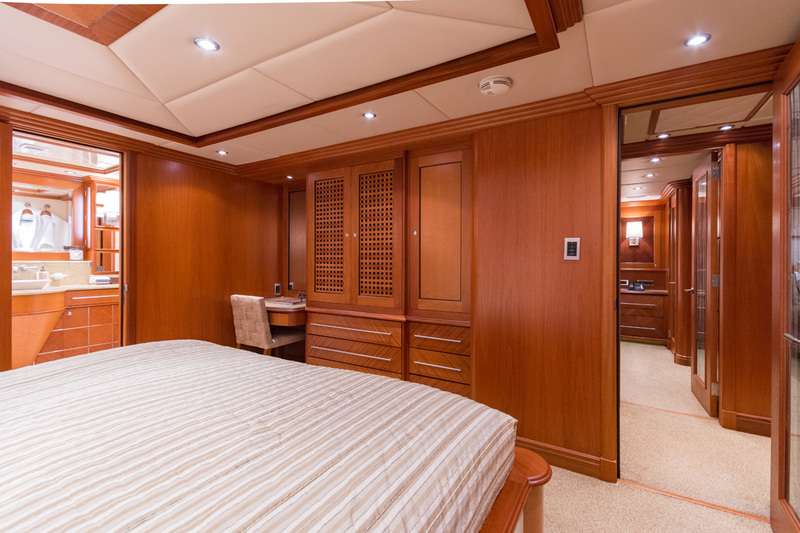 Forward to port: Spacious Stateroom with walk-around king size bed, 26” flat screen TV with DVD, individual satellite receiver, and surround sound. 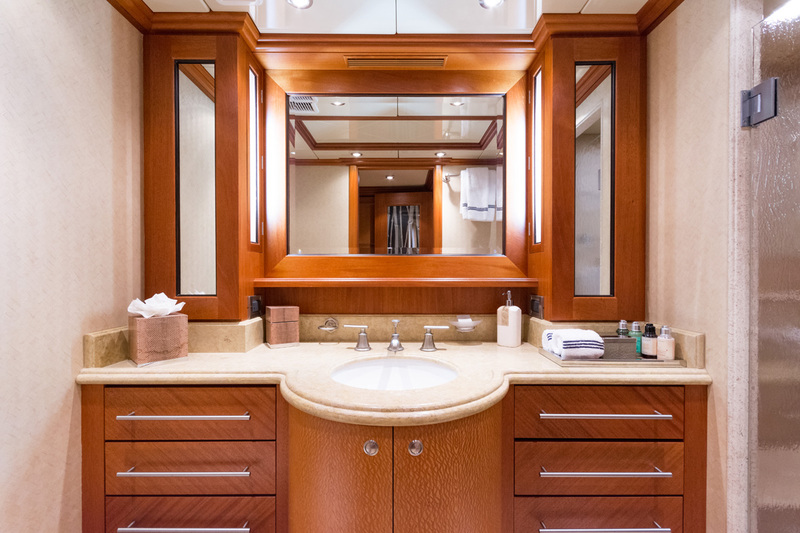 En-suite features head, marble countertop with sink and spacious shower. 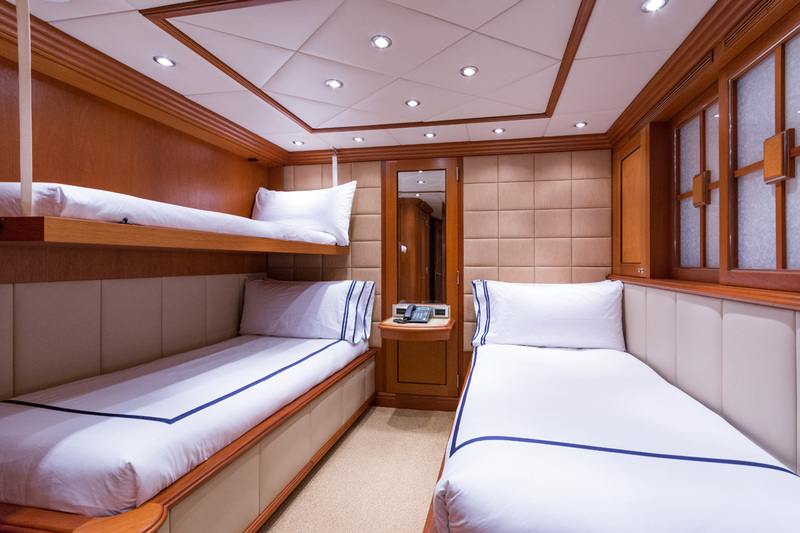 Forward to starboard: Twin Stateroom, with one Pullman berth, featuring 26” flat screen TV with DVD, individual satellite receiver, and surround sound. 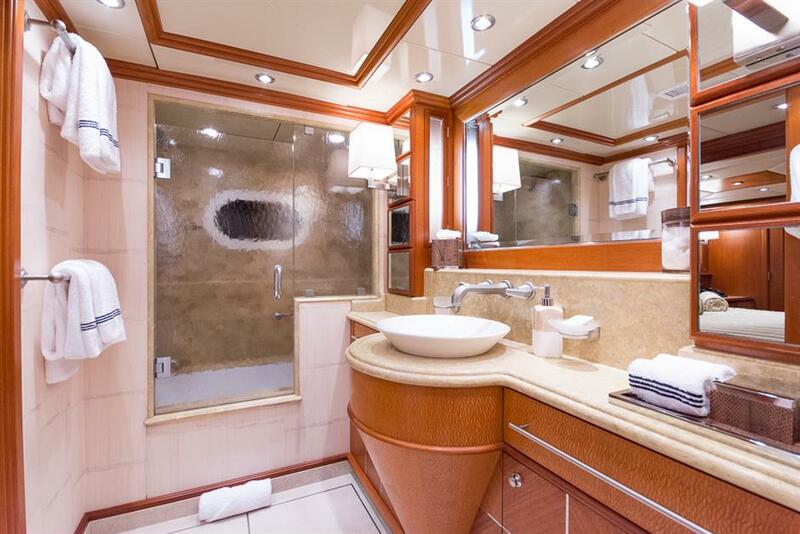 En-suite features head, marble countertop with sink and spacious shower. 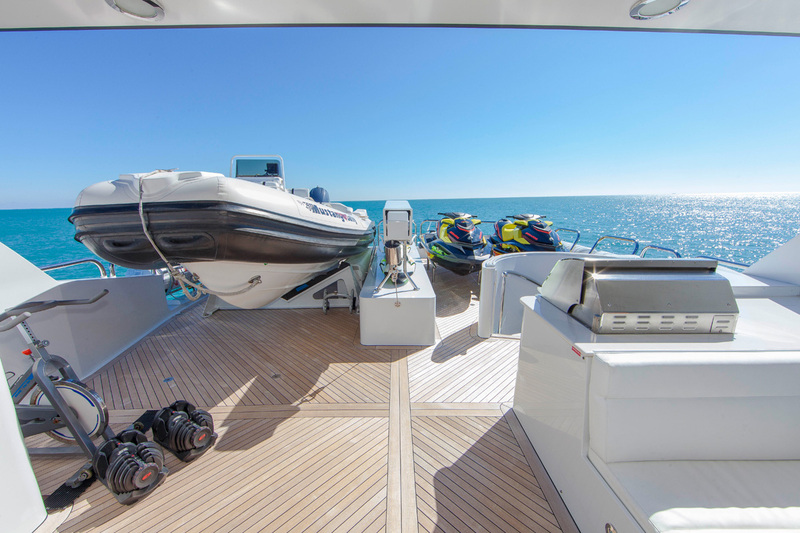 Tenders & Toys 19’ Nautica tender w/150hp Yamaha 2 x Jet Skis, 1 Waverunner, Snorkel Gear (adults and kids) Water ski’s (adults and slalom) Towables (Kneeboard, Wakeboard, and Tube) 6/8-person Spa Pool on deck Ship-wide music system with individual iPod docking stations throughout BBQ (on boat deck) Swim Platform with underwater lights Rowing Machine/Recumbent bicycle (stand alone, can be moved) Diving: Rendezvous only Communications Satcom and SatFax SSB	VHF	Cell Phone	Intercom	Computer, printer, scanner VSAT constant wireless internet access Entertainment System: Crestron video and audio equipment Audio Visual Equipment and Deck Facilities MAIN DECK: Main Salon with full wet bar, lounge area and 42” flat-screen TV with DVD, individual satellite receiver, and surround sound. 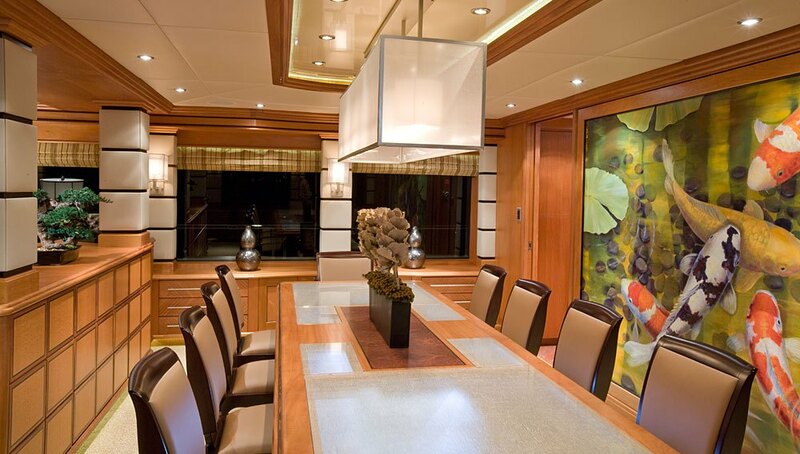 Formal Dining area for up to 12 guests. 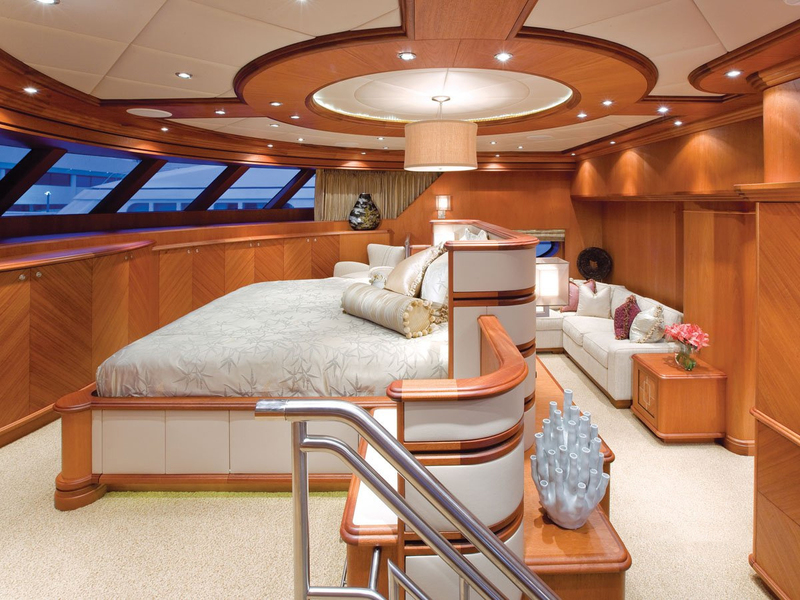 Day Head to Starboard. 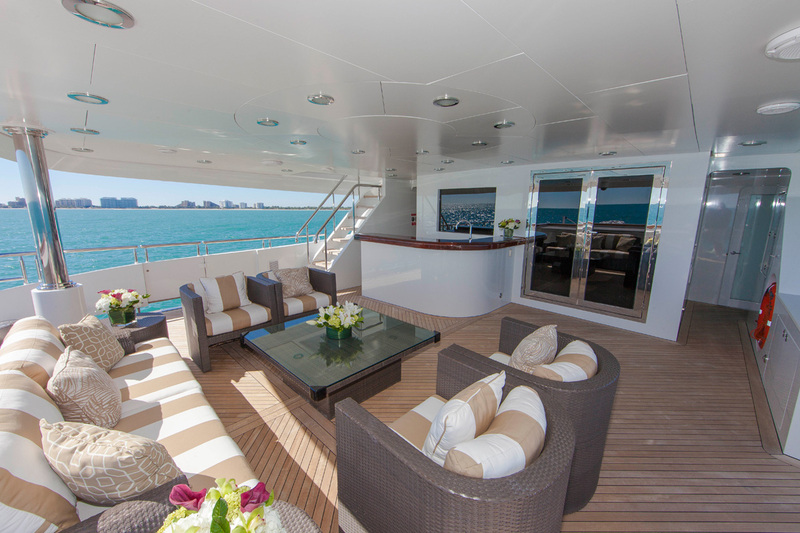 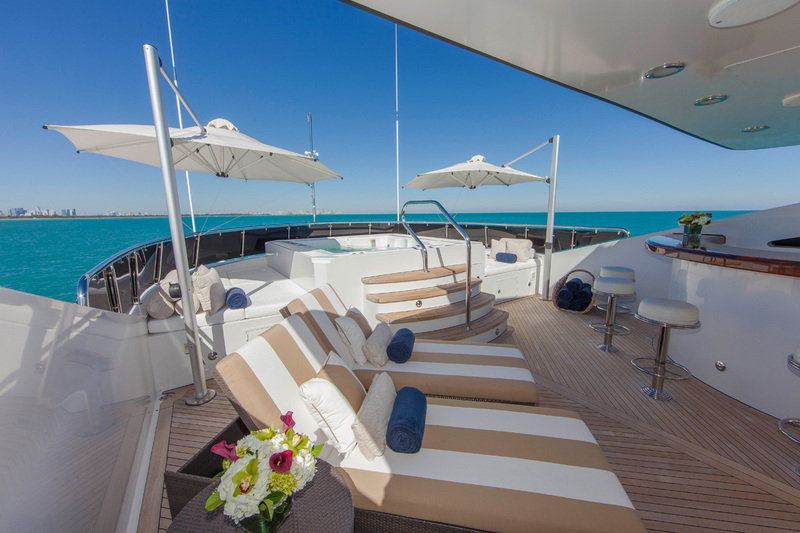 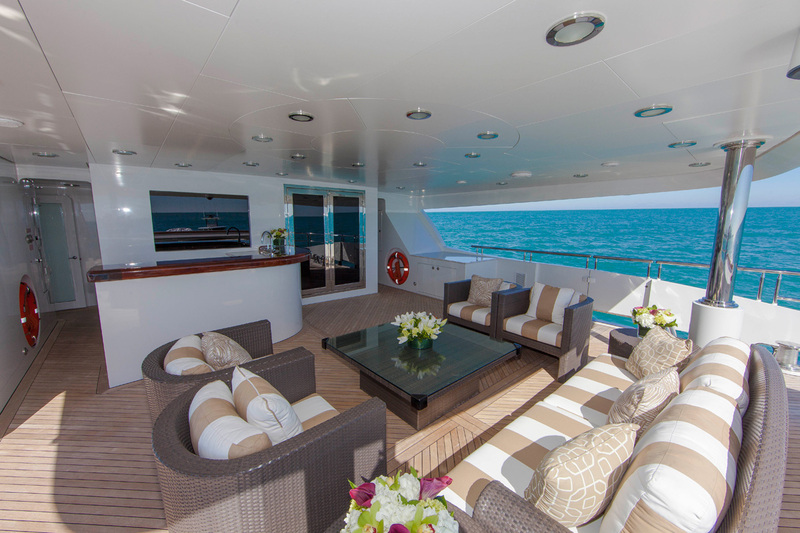 AFT DECK: Covered, casual seating, full wet bar with bar seating. 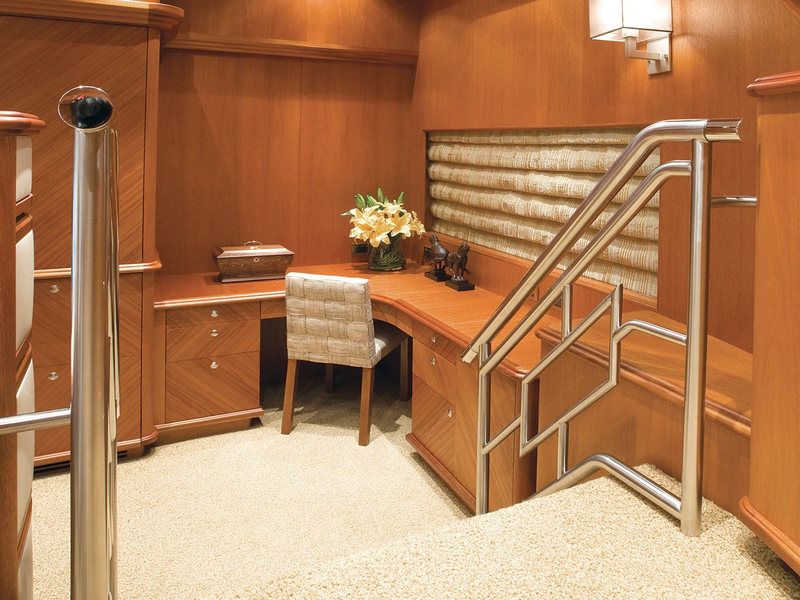 Port and starboard access to the swim platform, and stairwell to the bridge deck. 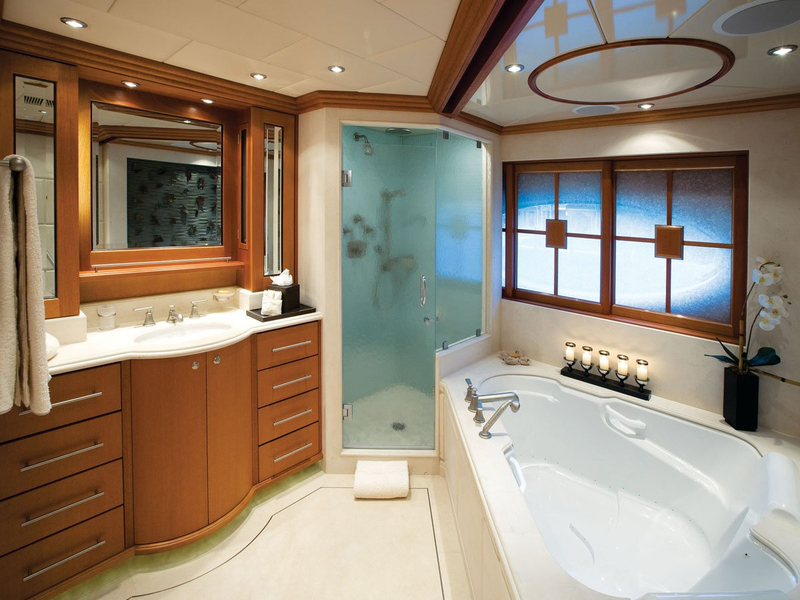 SWIM PLATFORM: Underwater lights. 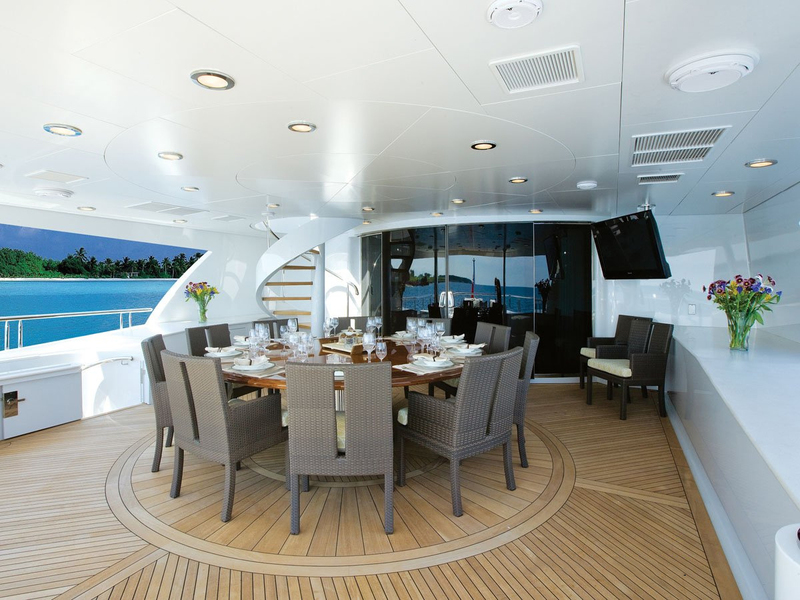 PASSARELLE hydraulic (to starboard) BRIDGE DECK: Semi-shaded, large round dining table. 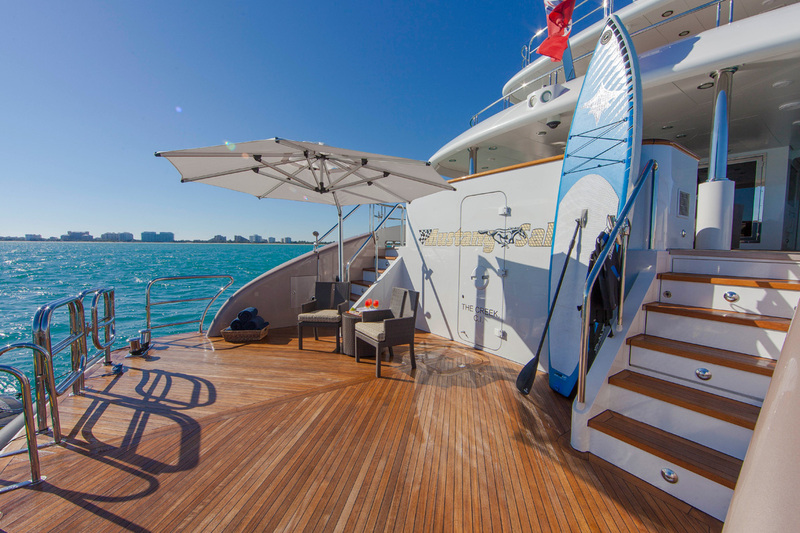 Access to the boat deck. 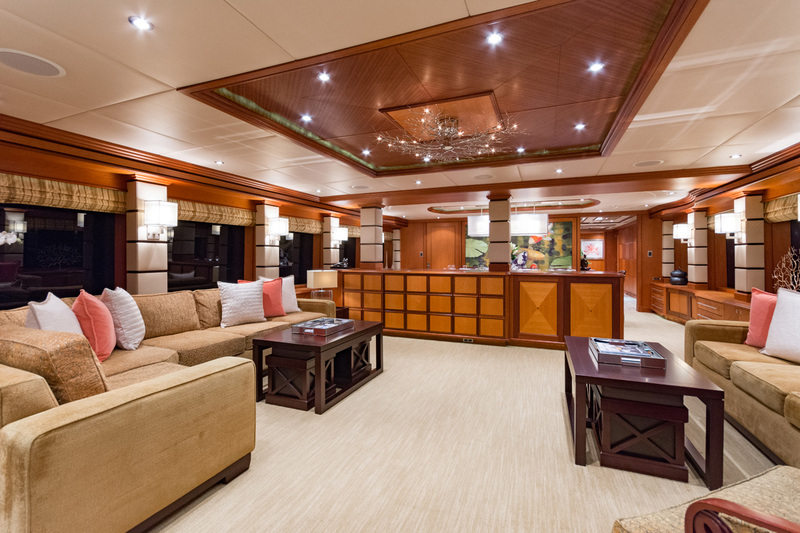 SKY LOUNGE: Full bar with bar stool seating, lounge area, game table, library, 62” flat screen TV with DVD, and individual satellite receiver. 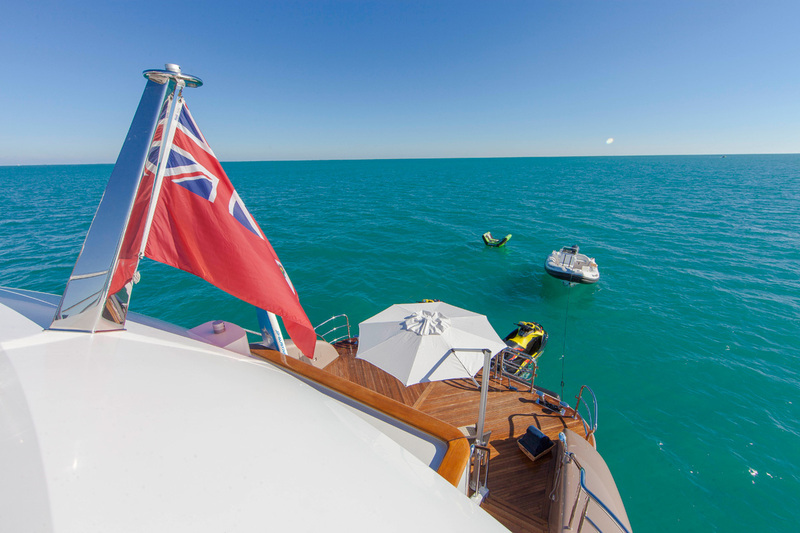 Day head to starboard. 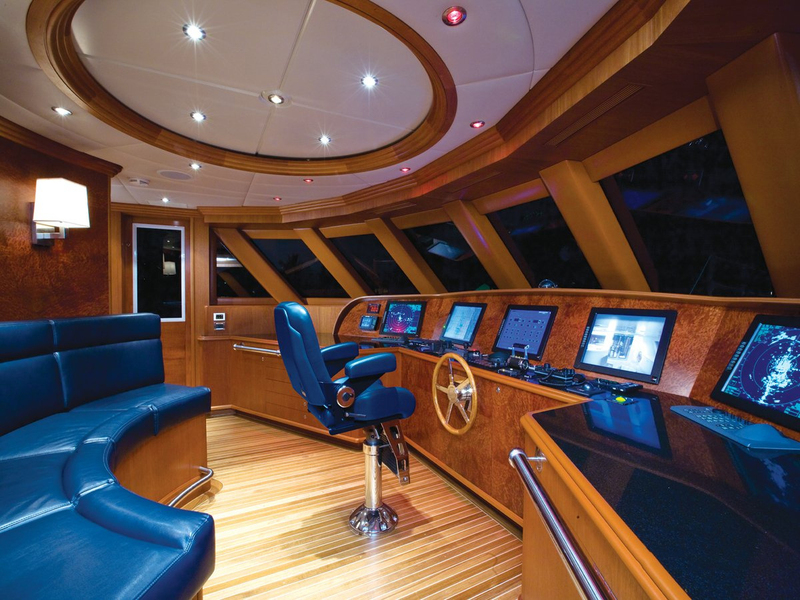 Bridge forward with access to Portuguese deck. 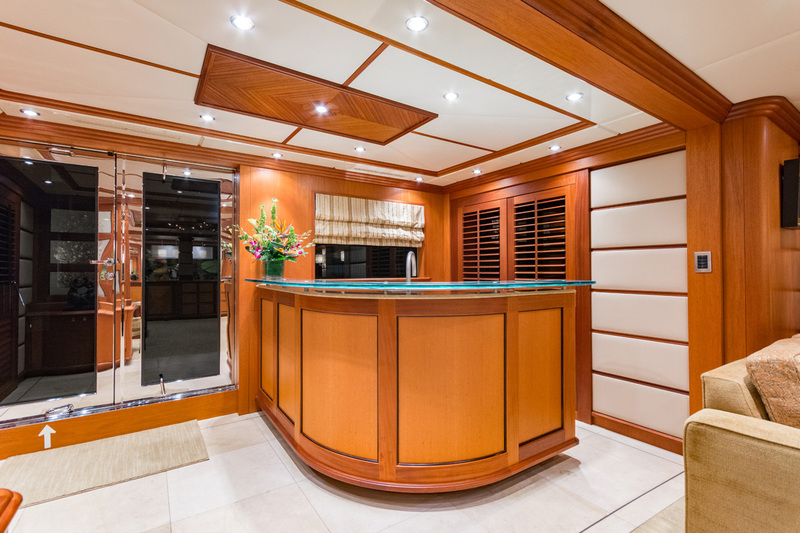 BOAT DECK: Semi-shaded, Spa Pool for 6/8 surrounded with large sunning pads, full wet bar with bar stools, al fresco dining to port, storage for tender and wave runners. 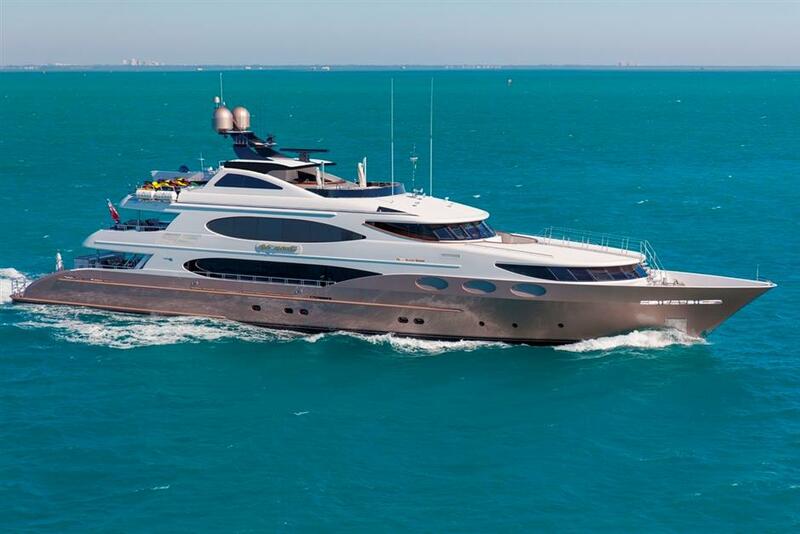 Day Head. 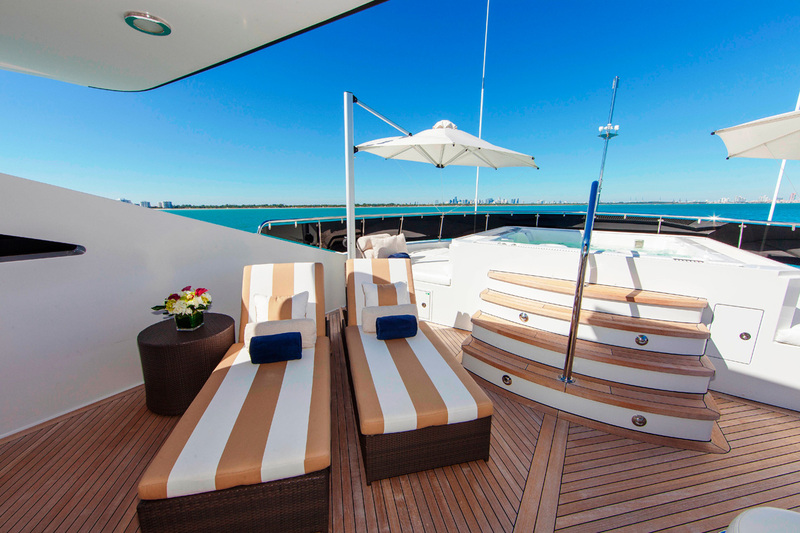 2 Chaise Lounges.